I am very pleased to show some exclusive photos of Ryan Slaton, RS (USA). He is famous for his "one of a kind" overview photos. For bigger size photos - please click on the 4-digit number below each photo (the first letters specify the photographer). # 4302: I followed Metrolink train 264 east this morning, first catching the train just above CP Kocian on Metrolink's Valley Subdivision. # 4303: Another view of 264 all stretched out near the old SP station of Russ. 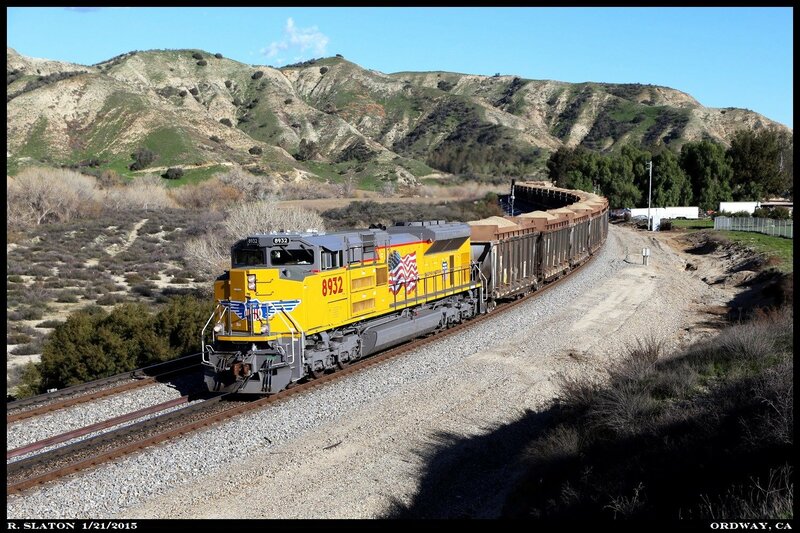 # 4304: After meeting Metrolink 264 at Honby, UP 7964 was again heading up the canyon. 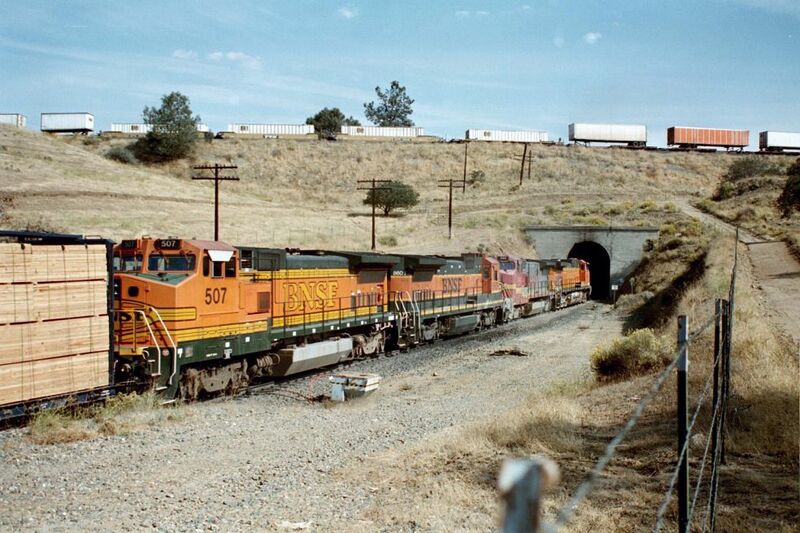 A few minutes after the meet UP 7964 was leading the ZLCLT-05 across the Santa Clara river just prior to entering the east portal of Tunnel 19. # 4305: Moving on up the Canyon our next run by was just down from Ravenna, as seen from the Soledad Canyon Rd bridge over the tracks/Santa Clara river. # 4306: After Ravenna 7964 went into the hole at CP Quartz to meet another eastbound Metrolink and so I beat feet up to my 'fail-safe' shot at Warren. 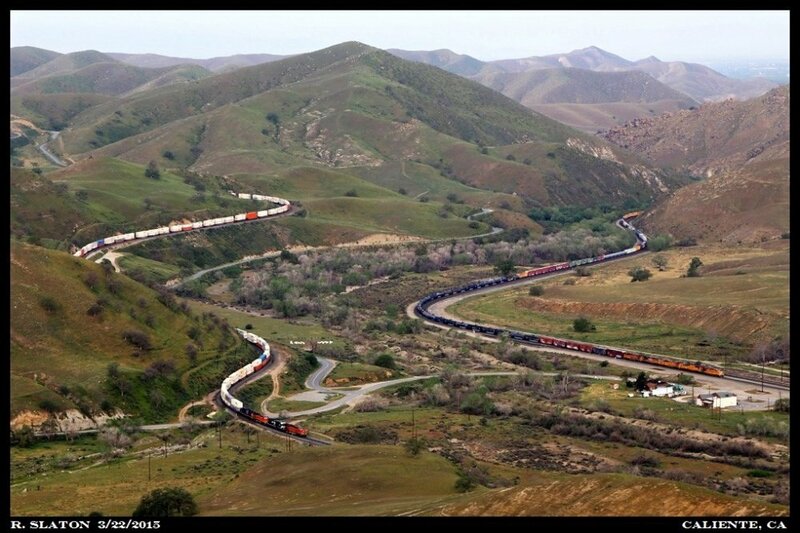 In no time at all UP 7964 came hustling up the eastern slope of the Tehachapi Pass. # 4307: Saturday while heading out the Needles Sub to intercept the UP/NS heritage duo I passed a westbound stack train at Pisgah that was sporting two 600s for power. As much as I love the warbonnets...yes even when they are faded...I was intent on catching the heritage duo so just kept pressing east. 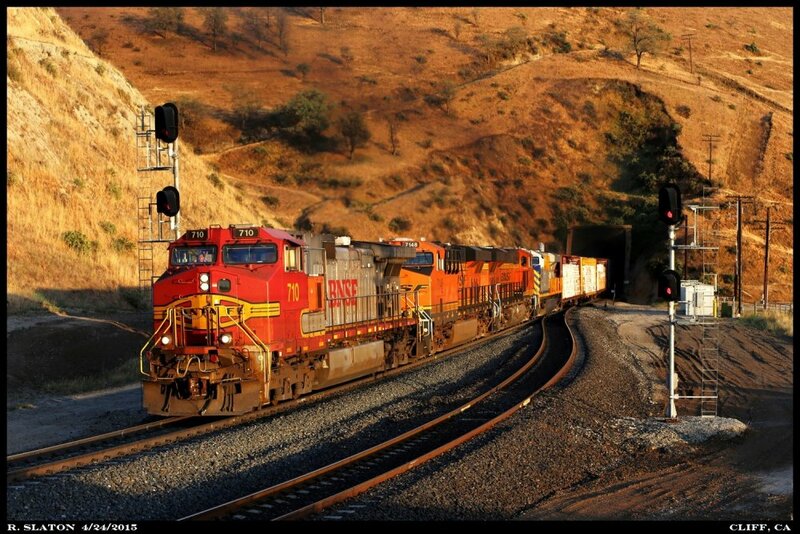 Later that night I spotted the Warbonnet duo again this time holding at Valley Jct. in Barstow waiting to head north towards Tehachapi. Figuring they were going to make a night run over the hill I thought no more of it...that is until this afternoon. 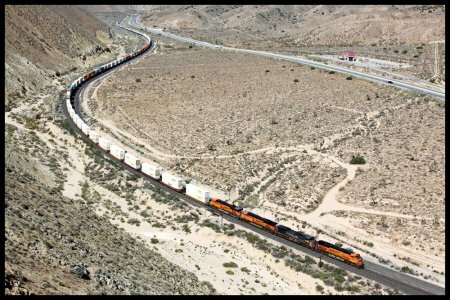 After hiking down from Warren I was on my way home when I spotted a BNSF stack train working up the hill just north of Mojave...and to my great surprise here came the warbonnets from the day before. I hustled back up to Cameron where I caught 646 and 682 working the S ALTOIG up the hill. Slowly but surely I am going through my photos from Monday's chase of Norfolk Southern's Pennsylvania heritage ES44AC as it led BNSF's Q NYCLAC into Southern California. After hearing that the unit would be running through to Barstow I made a last minute decision to join my friend and fellow TO member 'gjc' and head out to Needles Sunday evening. We got going early Monday morning and after breakfast in Needles we made our way out to Topock, AZ on the Seligman Subdivision to wait on the 8102. 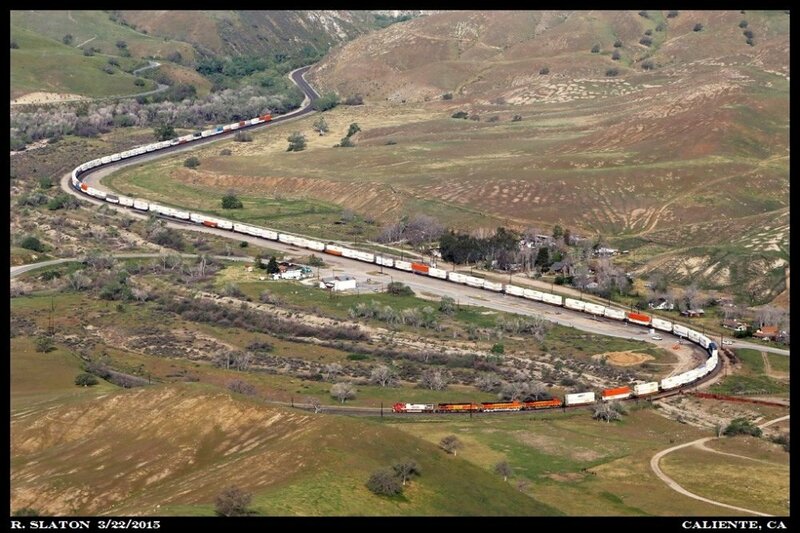 # 4295: It wasn't long before fellow fans began to arrive in Topock in anticipation of the special guest leading the Q NYCLAC. A little after 0800 the NS 8102 took center stage at Topock with NS 8102-9898-BNSF 670 up front. 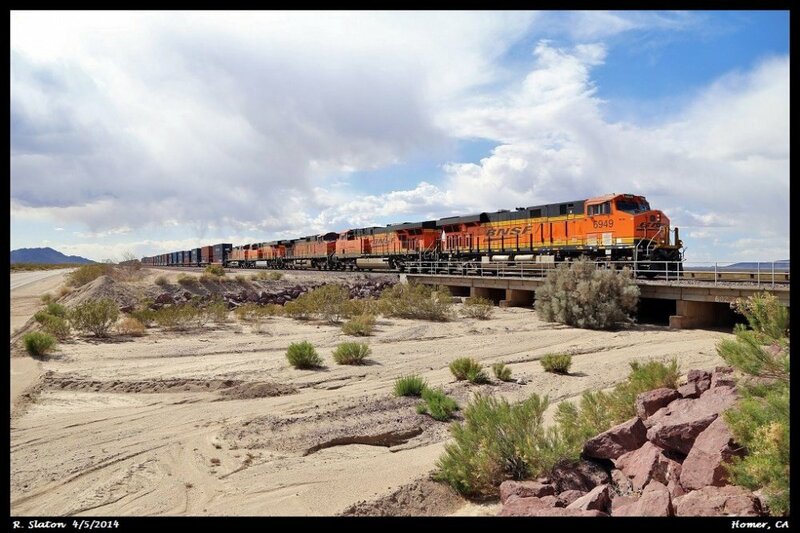 # 4296: At 0807 the NS 8102 passed the markers on BNSF's Colorado River bridge that signified its entrance into the state of California, the 4th NS heritage unit had arrived. # 4297: Monday morning dawned cool and cloudy in Needles but the clouds were starting to move off and clear sky's could be seen to the west. 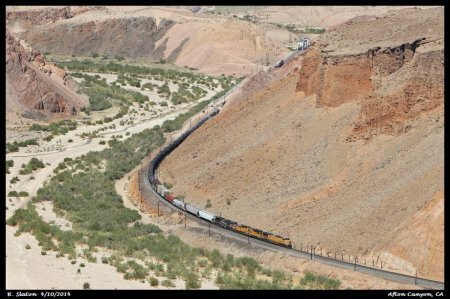 After watching the crew change in Needles we made our way up to Klinefelter where we set up for a broadside view of the train working out of Klinefelter Canyon. BNSF re-worked this area after suffering wash outs from flash floods in the summer of 2013. # 4298: Digging into the stiff and continuous westbound grade the Q NYCLAC was not a hard train to follow up Goffs Hill between Klinefelter and the summit of the climb at Goffs. Just west of Arrowhead Jct. the train is passing MP 596 with the Dead Mountains in the background. # 4299: Still pulling hard up Goffs Hill we caught the train a few times around Bannock and Homer before heading up to Goffs. 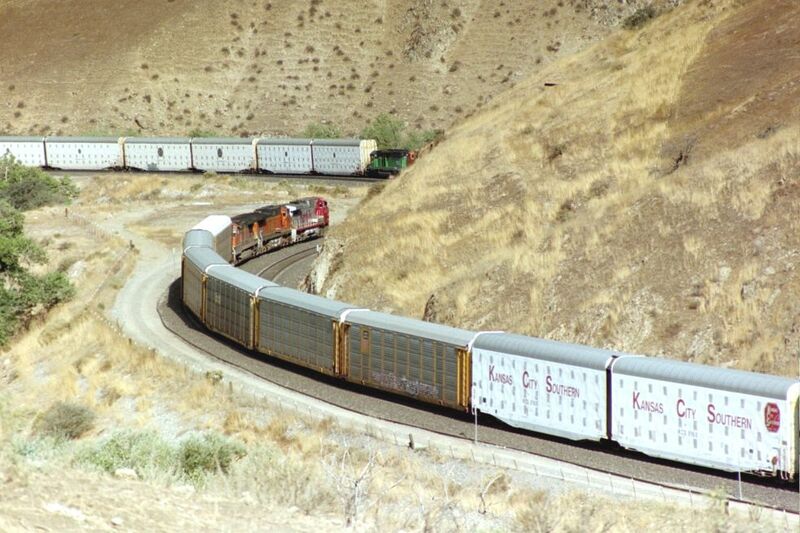 I won't bore you with every run by so here is one of the train near Bannock, CA. 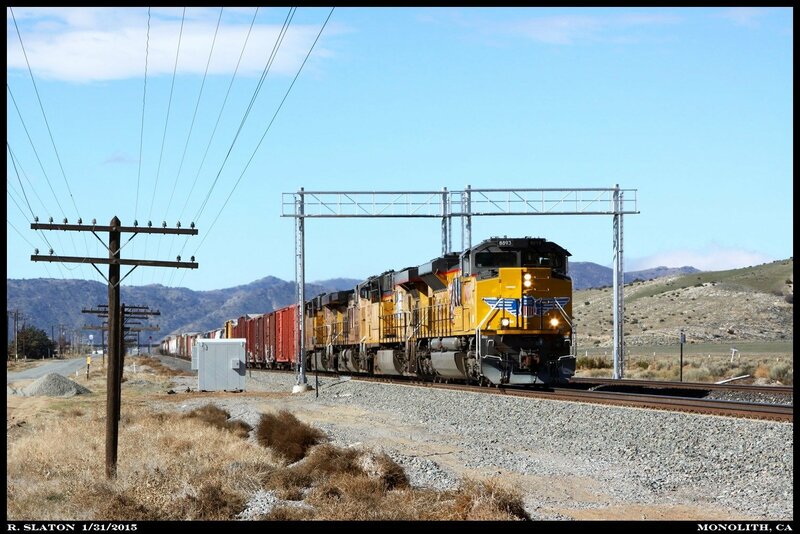 # 4300: NS 8102 looking good in the California sunshine, which would be the rule all the way to Barstow. I roughly have 1/2 the chase finished and I am still working on a few of the locations between Bannock and Homer, as well as from Amboy on west. Anyway this is more than enough from me this evening. 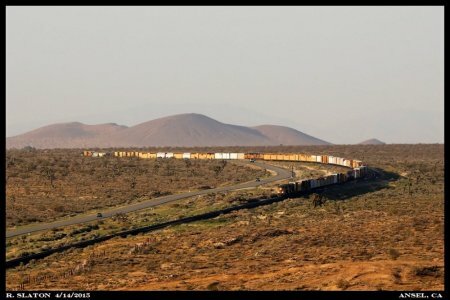 Thanks to those who provided updates on this trains progress west...it was really something to see and very much enjoyed by those out taking pictures of it. Back in early April my Dad and I met up with good friends 'Metal' Mike and George (gjc) out on the Needles Subdivision as we started our annual Spring Southern California trip. 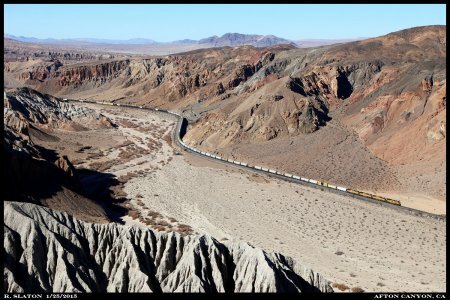 This year we started out by spending 2 full days and camping two nights out on the desert before heading west for Afton Canyon (where we rejoined the following Thursday), Tehachapi, and finishing 2014's trip off by heading down to see 3751 steam over to San Berdo. We have been doing these trips now (first year with the Needles Sub added on) for 4 years now and they always provide great memories. We were also joined by a few other friends throughout adding to the trip. # 4260: Saturday morning after camping the night and catching a few early morning eastbounds/westbounds west of Ludlow we set off for our first stop, Klondike. It certainly wasn't a long wait before our first train came along. Just west of Siberia the double tracked Needles Sub splits with main 1 swinging out into the desert to seek a gentler grade up to the summit of Ash Hill. 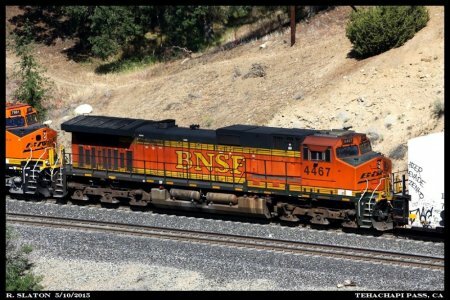 Working through the large S curve on main 1 BNSF ES44C4 7124 works the westbound Q CHILAC6-02K up the western slope of Ash Hill at Klondike. # 4261: After a slight break in traffic we started pushing east from Klondike, catching a few along the way. We again paused at Danby where the action again picked up as we explored some of the old mining settlement. 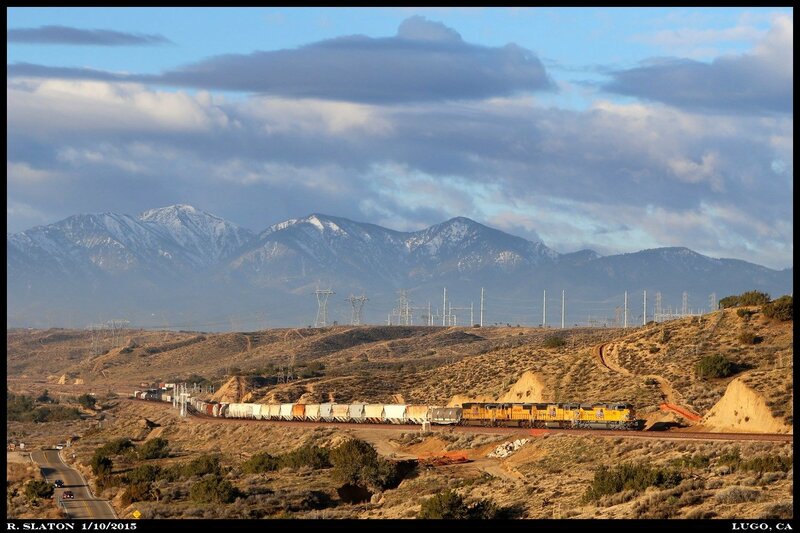 As clouds begin to push in from the west BNSF 7502 races across the desert with the S ALTSCO, one of the mines old silos still stands in the foreground. # 4263: Saturday morning had dawned cool and clear...albeit windy...but by the middle of the day clouds were pushing in from the west, lightly at first but as we were getting ready to leave Danby there were only a few patches of blue. Leaving Danby it even started to lightly rain on us. Settling again on the eastern slope of Goffs hill near Homer we found a break in the clouds for a few trains. With the smell of a fresh spring rain hanging in the desert air BNSF 6949 out races the clouds as it heads down Goffs Hill. # 4264: After spending some time at Ibis we were ready to head back into Klinefelter Canyon to camp out our second night. 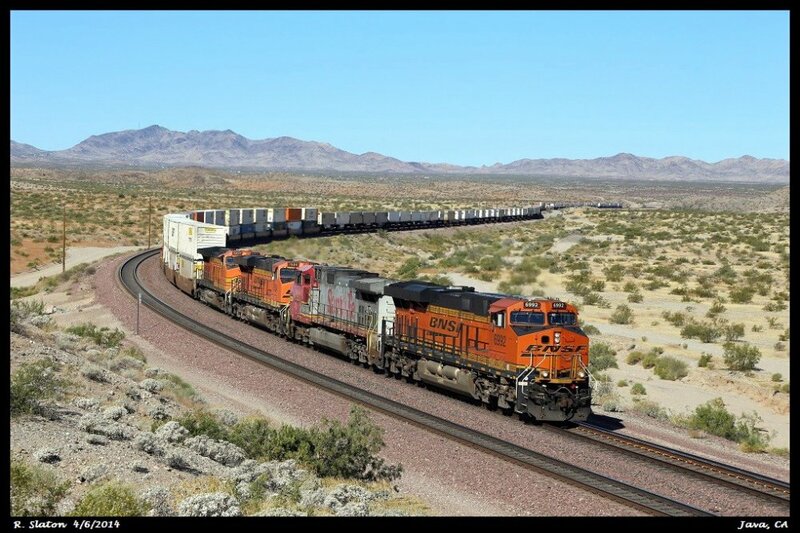 Along the way we spotted yet another westbound BNSF stack train contending with the stiff and continuous up hill grade out of Needles. So we paused just west of Klinefelter (station) to capture BNSF 4046 west. # 4265: After getting settled at our camp site in Klinefelter Canyon we BBQ'ed up some dinner. After dinner Mike and I decided it was time to set out and do some night shots. The first one of the evening was this short 30 second exposure of a east-west meet just down the hill from our camp site. # 4266: We spent the next hour or so hiking around the hills in Klinefelter Canyon. 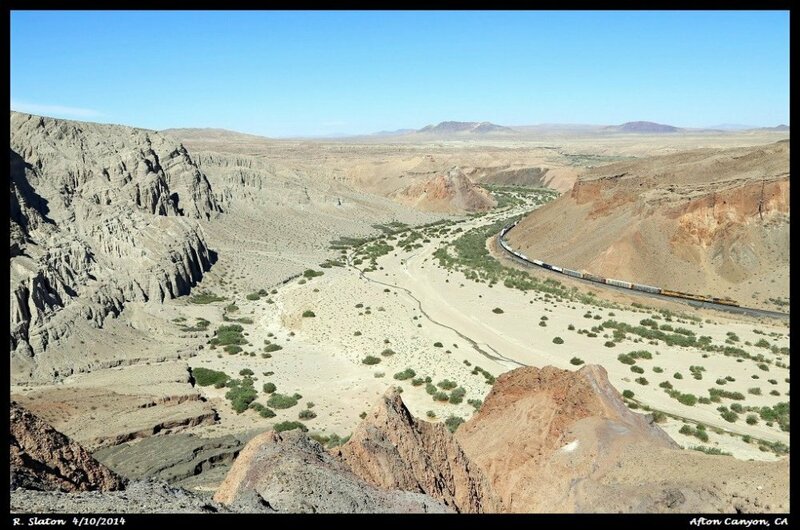 Klinefelter Canyon, located between Klinefelter and Java, is the passage where the Needles Subdivision slips between the Dead Mountains to the north and the Sacramento Mountains to the south. 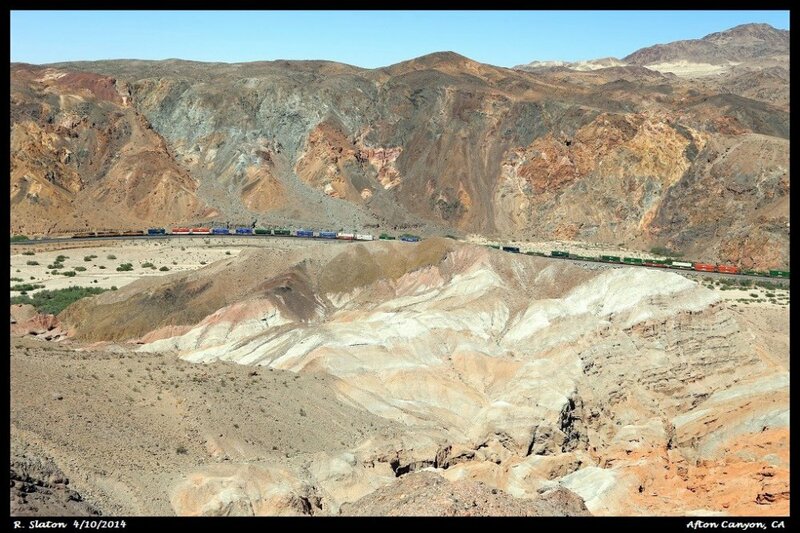 Around 2200 we paused up on a hill top as we were waiting for just one more train. 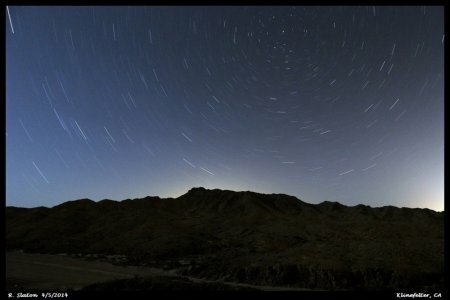 As we stood there swapping stories I took this 20 minute exposure of the Dead Mountains with the earth's rotation giving movement to the stars above. # 4267: As we were hiking back to our campsite the sound of a hard working westbound began to fill the air, so naturally we paused for another night shot. In this 657 second exposure we had a east-west meet in the Canyon with the moon just out of the frame. # 4268: Sunday morning we were blessed with clear sky's all day...although the wind did come back. We started out early heading down towards Java where we set up for a few eastbounds. Sunday a work crew was granted time on one of the mains between Goffs and Needles, thus the Needles Sub would be a single track railroad at its eastern end for most of the day. There were still plenty of trains, only now they were being run in fleets. 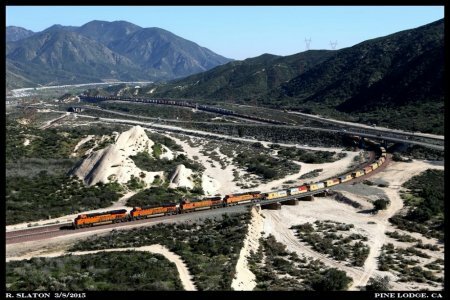 There was a large block of westbounds ready to go out of Needles but first three eastbounds were routed down Goffs Hill...the first of which came along in the form of BNSF 6992 east. 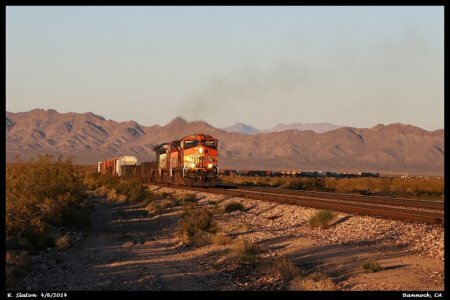 # 4269: Later in the afternoon there was still no shortage of westbounds, BNSF 7812 works a westbound 'pig' train up the continuous westbound grade just east of Ibis with the Dead Mountains in the background. 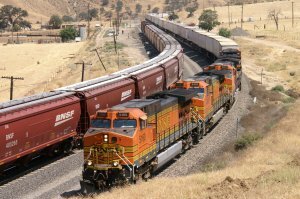 # 4270: As the day was running short we decided to follow a steel heavy H TULBAR manifest behind BNSF 4981-BNSF 794-CSXT 7698 up Goffs Hill. The heavy train was having a tough time on the grade, slowly but surely the heavy train roared passed us as we set up for another shot west of Bannock. # 4271: As the sole rear DPU on the H TULBAR earns its keep off in the distance a eastbound vehicle train sails down Goffs Hill as it heads for an awaiting crew change in Needles, some 20 miles away. 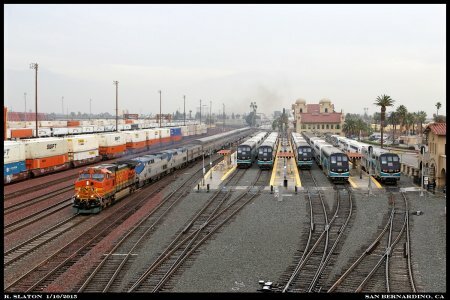 Over the past few years it has been a well kept tradition for my friends George (gjc), 'Metal' Mike, and I to meet up in the Spring for a few days of railfanning here in Southern California. 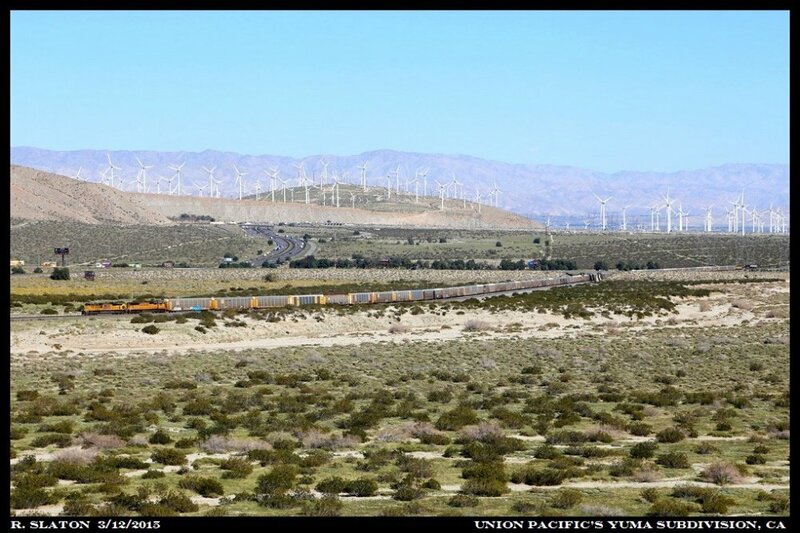 For the past 4 years our Spring trip has mainly focused on the rolling green Tehachapi hills along Union Pacific's Mojave Subdivision however with major track work and absolute work windows being in effect on the days of our pre-planned trip we had to improvise. After a very successful weekend outing (April 4-6) out on the Needles Subdivision (syscom3 is beginning to share his great images from that great weekend) we decided to meet back up on Thursday April 10th in Afton Canyon rather than Mojave. 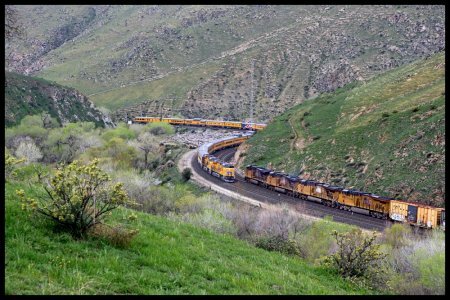 Stretching for roughly 7 miles between the stations of Basin and Dunn on Union Pacific's Cima Subdivision, Afton Canyon has become a bit of a irresistible force for us over the last month or two. The rock walls and formations along with their varying colors are absolutely stunning and it seemed that they were calling all of us back so it seemed a good place to kick off part two of our Spring trip. 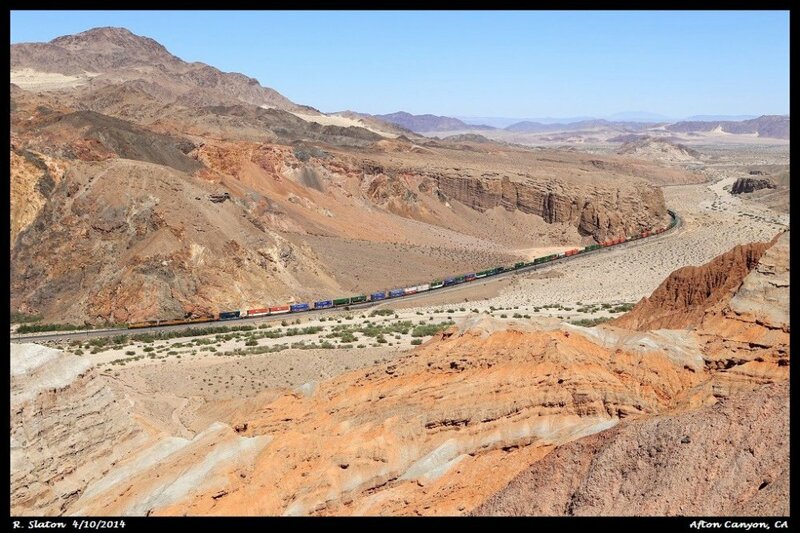 From 0730-1630 we were treated to 9 trains in the Canyon, below is a look back on that day. # 4272: Upon arriving 'on top of Afton' just after 0900 we almost forgot we were there to photograph trains. 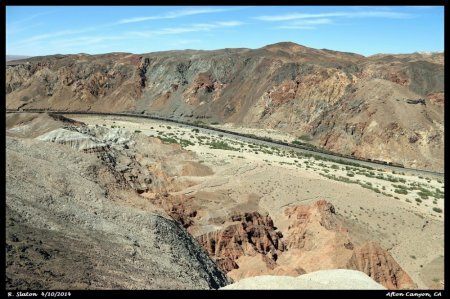 As we stood admiring the wonderful view that lay before us the sound of a westbound echoing throughout the Canyon caught us flat footed but certainly reminded us why we were there. 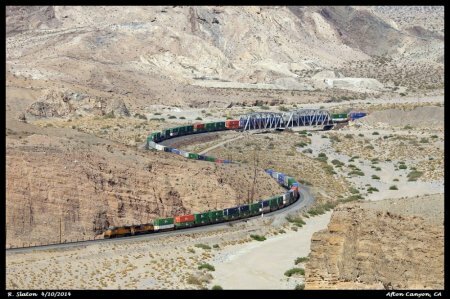 UP's westbound KG3LB led by UP 7356 would be the first train to cross our viewfinders Thursday morning and is seen rolling through the Canyon heading for a crew change in Yermo, some 31 miles away. # 4273: A look at some of Afton's trademark rock walls and formations. # 4274: After the 7356 rolled west we geared up for some hiking and set off towards the east. We set up on a hill top overlooking the Canyon/Mojave River wash and were soon treated to UP 7263-5132-7471 on the point of the eastbound ZLADV. # 4275: Following the ZLADV out of Yermo was the eastbound West Colton, CA to North Platte, NE manifest led by UP AC4400 7196. 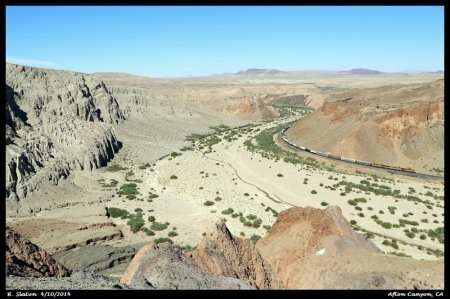 Conforming to the hill side near MP 193 the 2nd bridge crossing of the Mojave River can be seen near the top center of the photo. # 4276: Continuing east along the Canyon walls the distant sound of that oh so familiar long-long-short-long on the horn could be heard down at Basin. 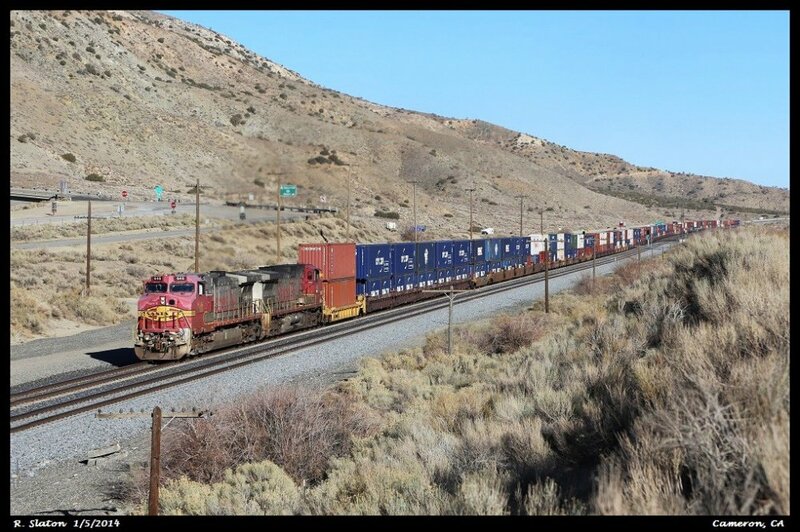 Working westbound through the eastern end of Afton Canyon UP 5691-7334 occupy the Cima Subdivision with the ISCLB on the drawbar. # 4277: Not to far behind the 5691 was yet another westbound, this time in the form of the KG1CIX. Stretched out along the Canyon floor among Afton's rock formations, the KG1CIX is west of MP 194. 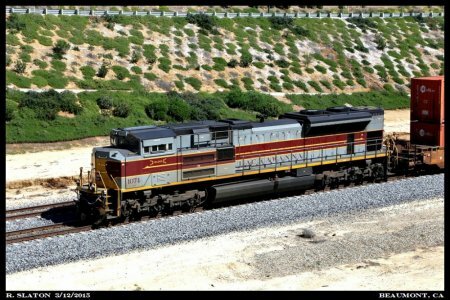 # 4278: A broadside view of UP 7345-4923-4635 and the KG1CIX under the northern slope of Afton Canyon. # 4279: After the westbound KG1CIX passed we headed back to the truck for lunch, after which we again hiked up above the east end of the Canyon in time for a eastbound which had just highballed Dunn. 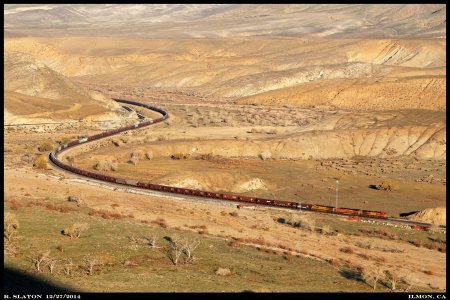 With the deep roar of the eastbound reverberating throughout the middle of Afton Canyon UP 5738-6200-5595-8786 roll down towards MP 194 with the OLSIS empty ore train. # 4280: Pushing a little further east we heard one more eastbound highball Dunn which soon arrived in the form of the ZCIG1 behind UP 8319-5060. 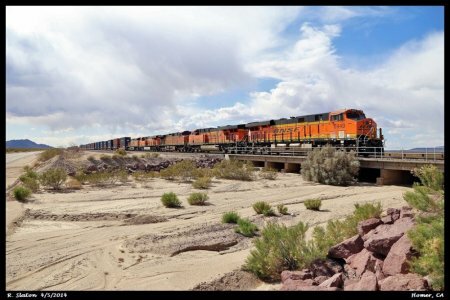 # 4281: A telephoto view of the ZCIG1s DPUs, UP 8470 and 4561, rolling east and rounding an S curve before crossing the 3rd bridge over the Mojave River. 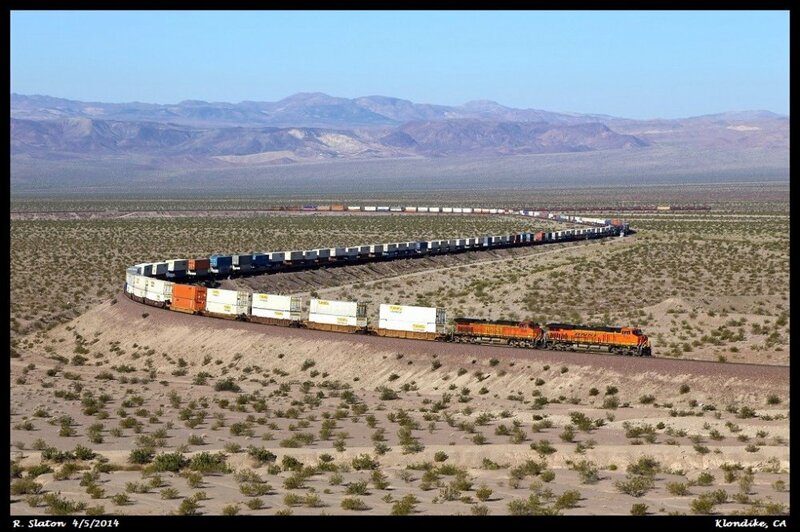 After this eastbound we got one more westbound, a shorty cement train heading for Mojave which reminded us it was time to head west as well. # 4165: After working their way through the San Fernando Valley on the way up from Gemco yard in Van Nuys, Union Pacific's Saugus local has reached the western most end of their run at Honby. After tying their train down the power for the day's LOF42 takes a moment in between Metrolink commutes to run around their train. Once the power is on the east end the Saugus will be ready to switch Weyerhaeuser Building Materials (in Via Princessa) and Phillip's Plywood (in San Fernando) before returning to Gemco to tie up for the day. 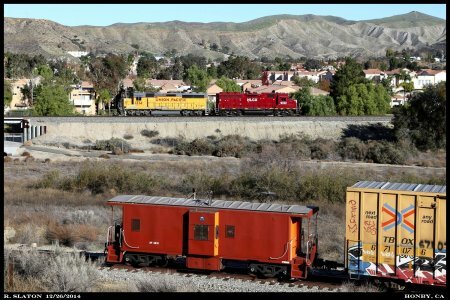 Former SP C-50-7 class caboose 4612 (now a shoving platform) in the foreground is on the siding while UP 1374 (ex SP GP40-2 7610) and HLCX 1032 (ex IC GP40 3038) run around on the main. Honby is at MP 38 on Metrolink's Valley Subdivision, just west of Via Princessa, CA. 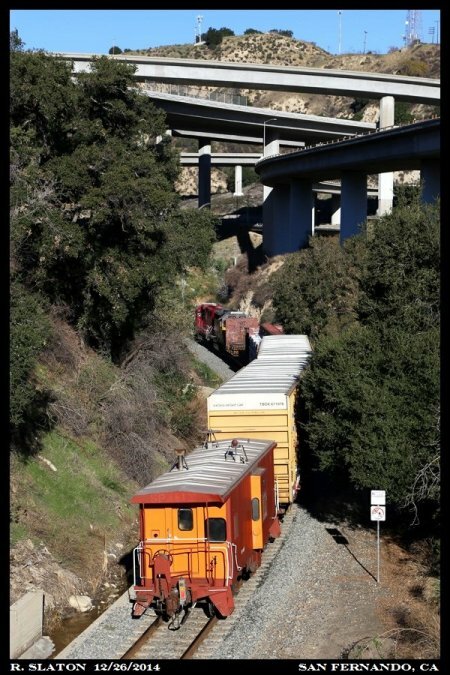 # 4162: Running up above the northern bank of Caliente Creek a eastbound BNSF Z rumbles through Ilmon and towards the twisting confines of the Caliente Narrows. Prior to the 1983 flood Ilmon was the location of a passing siding, the east end of which was once located just up from the head end of the Z. Just to the right of the train's lead motor (BNSF 4931) the old siding right of way diverged from the mainline to briefly hug the hillside before returning to run side by side with the mainline down towards the west end, where the siding again briefly diverged to run up along the hill side north of the tracks. This alignment survived the 1983 flood and was for a time a portion of the double tracked alignment but was eventually straightened to the alignment we see today. 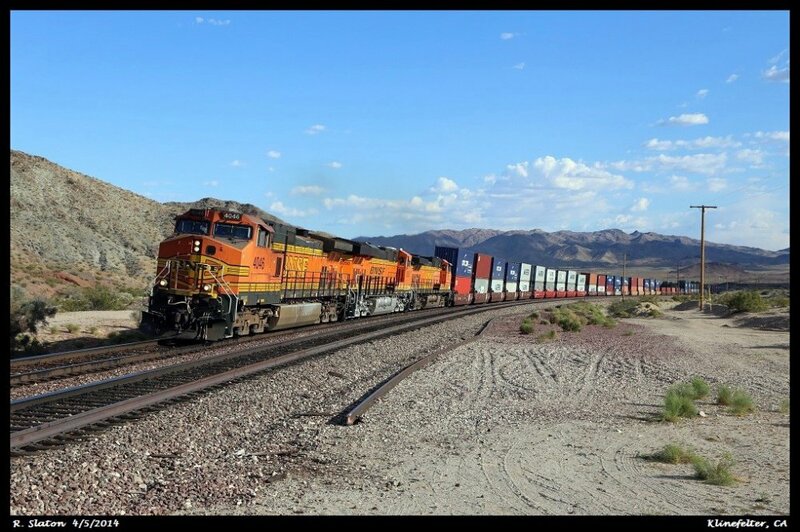 Although all 4 motors are GEs they are all 4 different models; BNSF C44-9W 4931, UP C41-8W 9359, UP C40-8 9320, and BNSF ES44DC 7362. # 4166: The first train on the morning of Saturday December 27th, 2014 which found itself in my viewfinder was this eastbound BNSF 'earthworm' empty grain train. The trio of GEs running point are rattling across the switch that marks the start of double track through the Caliente Narrows. Just west of Ilmon the tracks cross from the south bank of Caliente Creek to run along its northern bank up to Caliente. 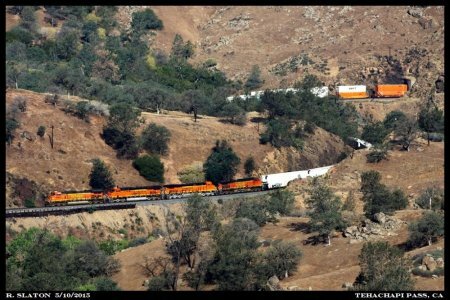 # 4163: On a cool and overcast December 28th, 2014 BNSF's eastbound S OIGLPC3-26 eases down the eastern slope of the Tehachapi grade behind motors CREX 1431-BNSF 7295-BNSF 8202. 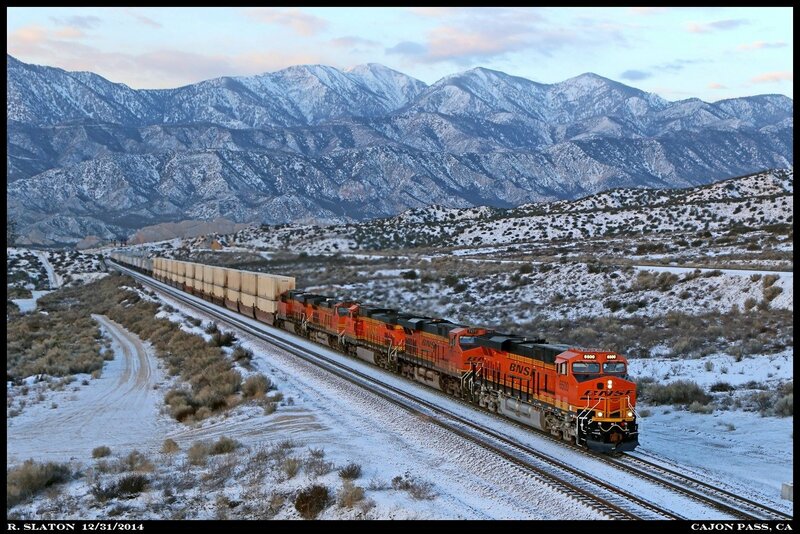 # 4160: Last night a light dusting of snow coated Southern California's Cajon Pass, a welcome sight for a desert dweller. 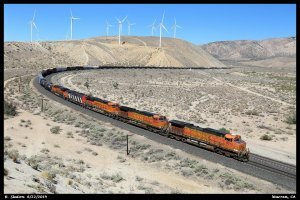 Just after sunrise this BNSF 6500 leads the eastbound Z LACWSP8-31 up main 1 passing 'Hill 582' on the western slope of Cajon Pass. Nice way to cap off 2014. 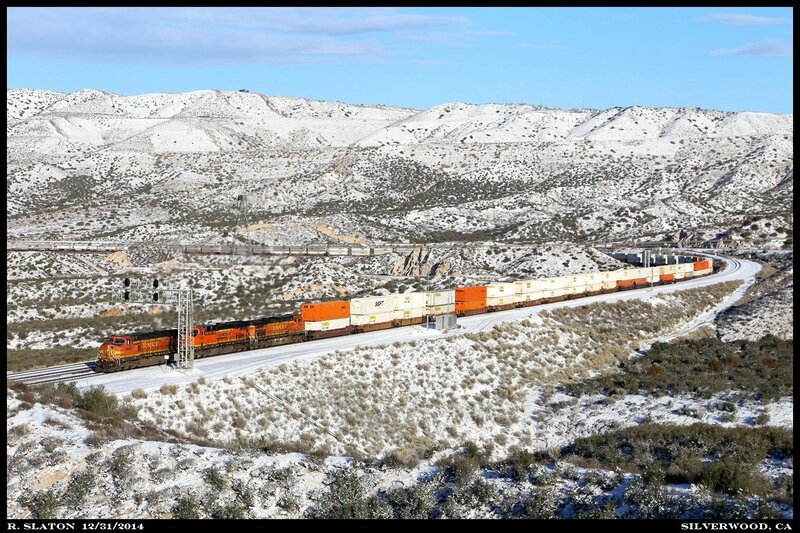 # 4164: Amidst a light coat of fresh snow BNSF 5445 has Cajon Summit within view as the eastbound Z SBDALT7-31 labors through Silverwood on the final day of 2014. 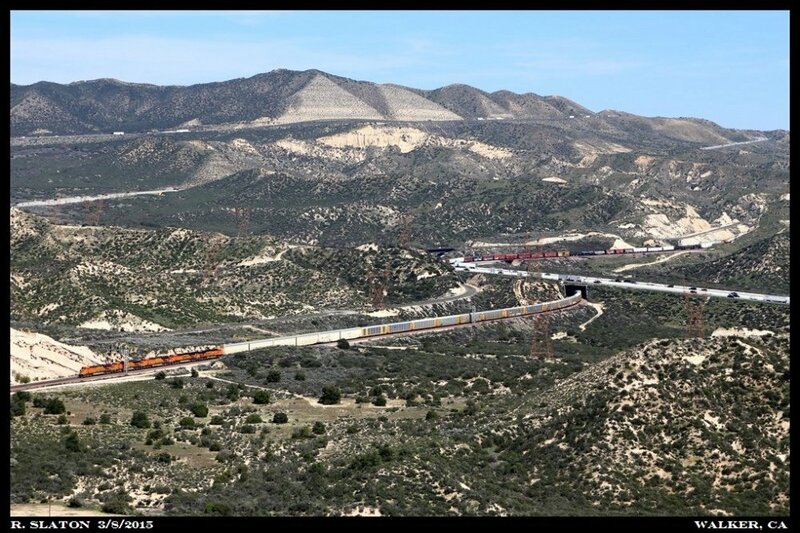 The UP Mojave Subdivision-BNSF Cajon Subdivision connector at Silverwood can be seen at right. # 4161: Under a spider-web of freeway ramps at the California 14 Freeway and Interstate 5 junction Union Pacific's westbound Saugus local prepares to leave the San Fernando Valley behind and works its way towards the 6740' Tunnel 25 under Newhall Pass. 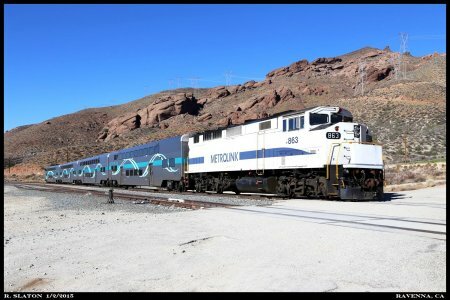 This was once Southern Pacific's Saugus Line between Palmdale and Los Angeles, today the line belongs to Metrolink as their Valley Subdivision. # 5002: By 0930 the patches of blue were all but gone anywhere you looked so I headed back towards Cajon. I had it in mind to do some scouting hikes on Saturday to check out a few angles that I have been after for awhile. The clouds actually helped with this as it provided 'neutral light'. 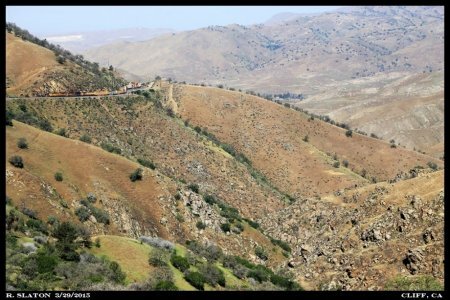 For my second scouting hike of the afternoon I started by following the hills up along the old SP tracks starting at Canyon siding and headed compass south towards the Swarthout Canyon area. I made it down to MP 473.25 (on the ex SP) before starting back towards Canyon. Standing up on a cut in between UP's Mojave Sub and BNSF's Cajon Sub I captured BNSF 8030 and 5390 lugging all out on the point of a long eastbound stack train running out of the Ports. This view is looking south towards the old Cajon Campgrounds and Swarthout Canyon Road. By now there was a light rain falling in Cajon and in much of Southern California, which is much needed! # 5001: With work windows up on Tehachapi for the next few weeks I decided to head over to Cajon on Saturday January 10th. The forecast showed clouds rolling in Friday night for an upcoming storm but originally the weather-folks were saying no rain until late Saturday night-early Sunday morning. 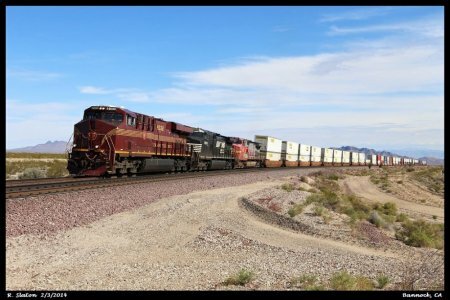 As I was leaving I received a heads up that brand new UP SD70AH 8912 was leading the eastbound West Colton, CA to North Platte, NE manifest and had just departed West Colton. Getting on the road Saturday morning I spotted a few large patches of blue sky's east of Cajon Pass out towards Lugo-Hesperia so that's where I headed to start the day. With clouds starting to build up over the San Gabriel's in the background UP 8912-3969-4263-3908 coast down the eastern slope of Cajon at Lugo. They are only new once and there is nothing quite like the UP's 'battle flag' scheme when it is new. # 5003: Another train I was on the watch for Saturday was Amtrak's 9 hour late Southwest Chief. The few times I have caught the Chief running late in Cajon it has always taken main 3 down the Pass from Summit, so I set up along main 3. As luck would have it Amtrak was lined down main 2 and all I could do from where I standing along main 3 was watch the very top of it roll down grade towards Pine Lodge. Getting on the road I managed a really crappy grab shot of the train passing through old Cajon Station. 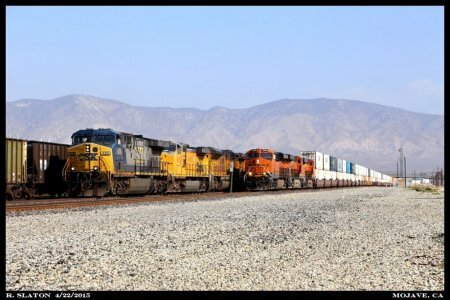 Un-happy with that shot I decided to try for another run-by and ended up following #3, which had picked up BNSF C44-9W 5483 in Argentine (Kansas City), down to San Bernardino. 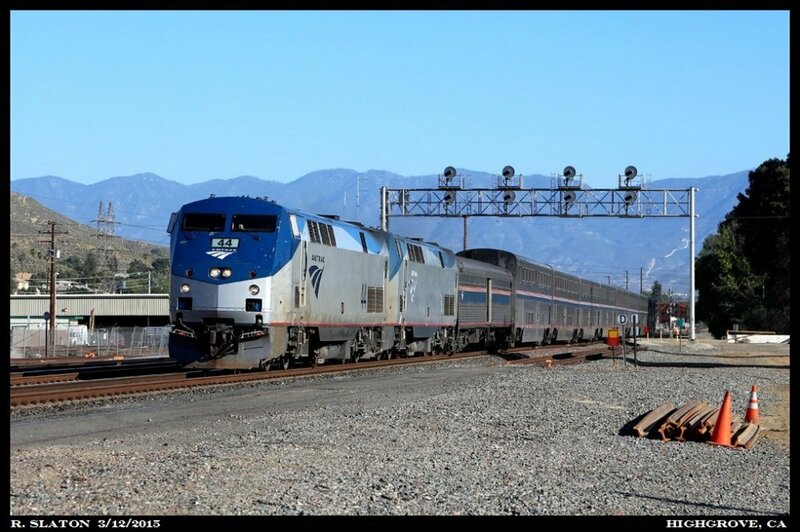 In a light drizzle the train made its station stop and then highballed San Berdo 9 hours and 32 minutes late. 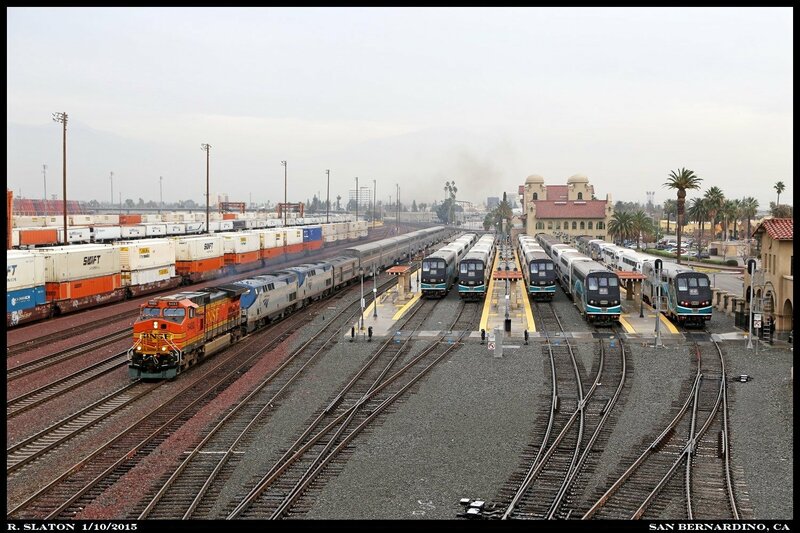 At right the line up of Metrolink commutes stand on their station tracks awaiting the weekday rush. At right distance is the 1918 build Santa Fe passenger station standing in contrast to the modern era of railroading that has been built up around it. # 5004: After pausing for traffic ahead to clear up BNSF's westbound Q CHISTO is throttling up and again pushing west behind a colorful lash up which includes: BNSF SD70ACe 9093-BNSF C44-9W 636-NS C40-9W 9398-UP C44AC 6440. This is Lavic on BNSF's Needles Subdivision. # 5005: Under the Vazquez Rocks Metrolink F59PH 863, operating is push mode, drifts down grade through Ravenna with eastbound train 216. 863 is still sporting Metrolink's once standard locomotive paint scheme, which is in remarkably good shape. With no other pressing plans for today I made the trek back over to Cajon Pass this morning. I was at first greeted by thick cloud cover which gradually gave way to sunshine by 09.00 h. There was a major work window open on Cajon this morning as a track gang was replacing rail on main 2 between Summit and Silverwood. Trains were still running on mains 1 & 3 however only one train at a time could pass through the work zone. For the most part eastbounds were routed up main 1 and westbounds down 3 in fleets however some westbounds had to wait for a clear passage down main 1 due to the steep grades on main 3. By 1330 the clear sky's were being crowded by pesky high clouds so I ended up calling it a day by 1400. Made it home just in time to watch my Packers end their season. 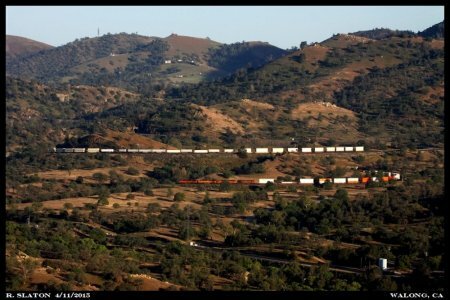 # 5006: Having conquered Cajon Summit BNSF 7072 now slips down grade through the curves approaching Martinez on the point of a eastbound stack train. 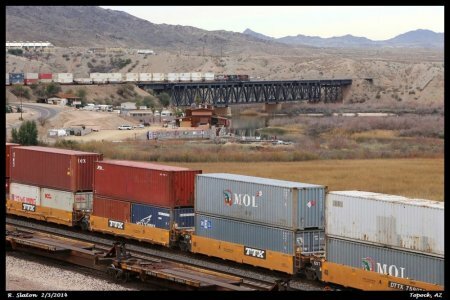 In the distance the rear of a westbound auto train can be seen on main 3 waiting to be flagged through the maintenance window. 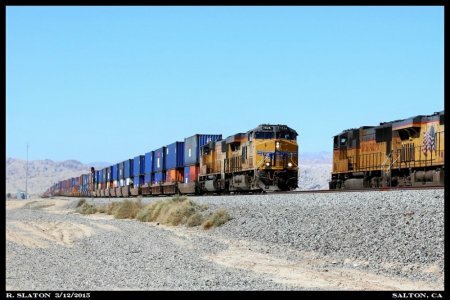 # 5007: A solid brace of Union Pacific EMDs hold back the westbound ISCLB as it coasts down main 3 approaching Blue Cut. 'Heavy' SD70AH 8831 is on the point. # 5024: Upon arriving in the Pass Sunday morning there was a parade of eastbound trains waiting for a few westbounds, including a late Amtrak 3, to come down the hill. One by one the westbounds cleared the work zone and then it was time for the eastbounds. 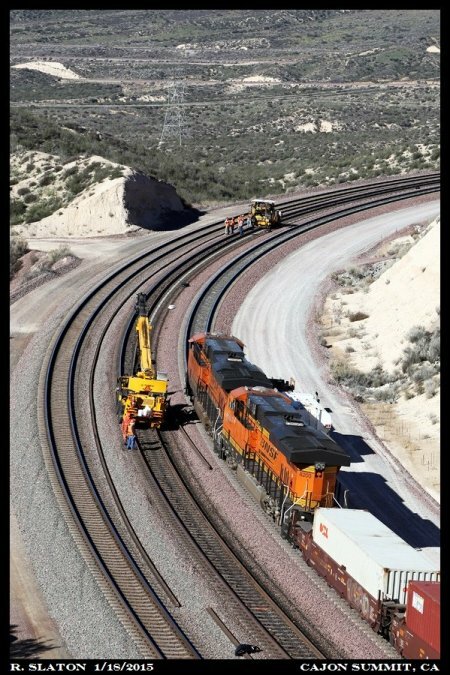 After getting one hotshot BNSF eastbound Z up main 3 the eastbounds holding on main 1 were one by one flagged through the work zone. Starting out my morning down near Blue Cut the first train that would find itself in my viewfinder was UP's eastbound K-Line stacker (ITSAH3-14) led by UP 7278-CSXT 812-UP 8210. The eastbound stack train is leaving Blue Cut and rolling up towards old Cajon Station where it will pause to allow traffic ahead to clear the work zone at Summit. # 5025: And finally a trio of UP trains came into view as the 8212 muscled its way into Hiland. 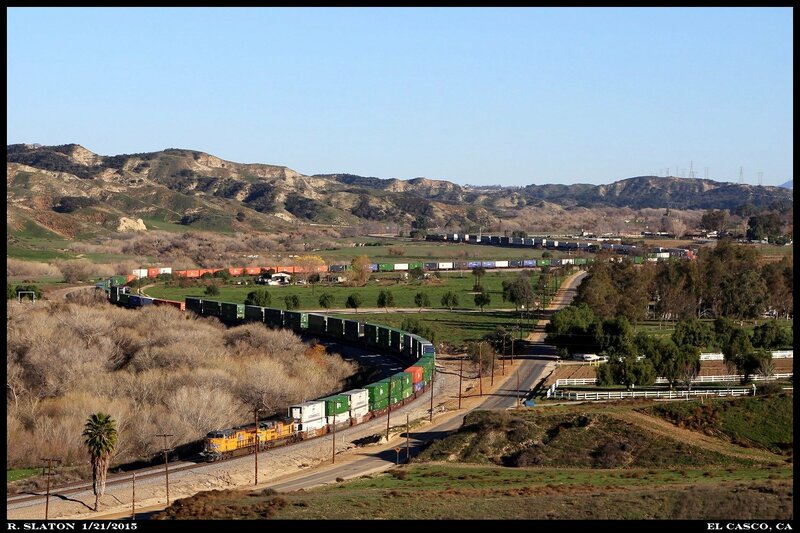 In the siding a Roseville manifest is tied down awaiting a crew while down on the Cajon Subdivision (at right) a westbound UP stack has just pulled up on main 3, awaiting its turn to be flagged down the hill. 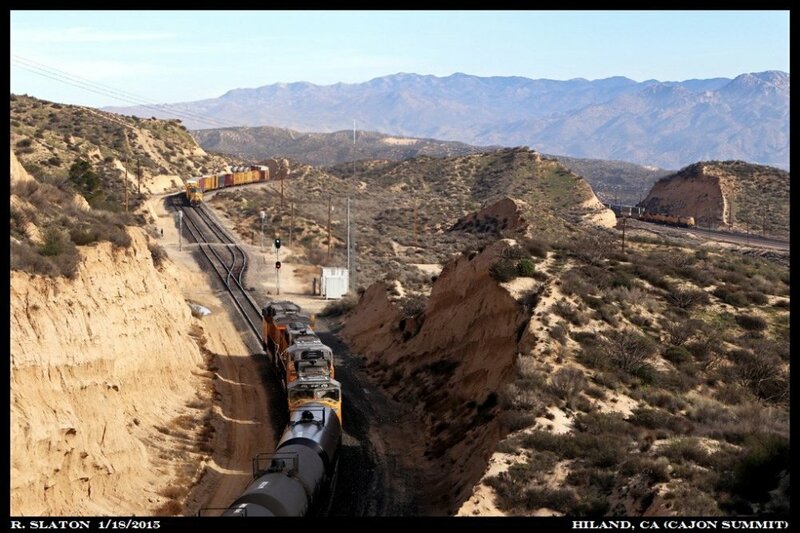 The original Santa Fe Cajon Summit right of way can be seen just to the right of Hiland siding. # 5026: Since they were only allowing one train at a time through the work zone the DS had been fleeting eastbounds up the hill but now had a few westbounds that needed to get down the hill, including a hot shot and two that had crews running low on hours. After getting the K-Line stacks and a eastbound UP helper set up the hill it was time to open the gates for the westbounds. First out was a westbound stack bound for the Ports led by BNSF ES44C4s 7122 and 8200. 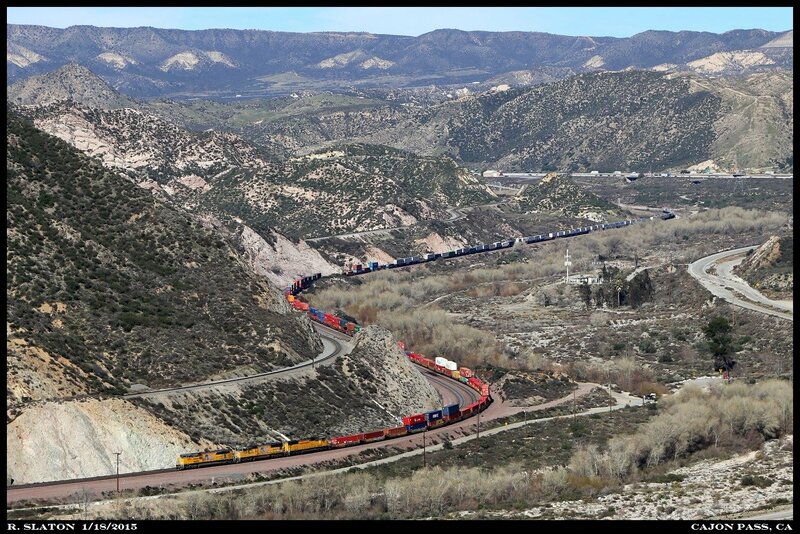 This westbound was crossed over to main 1 at Lugo as they were not qualified to go down main 3 due to the steep grades. 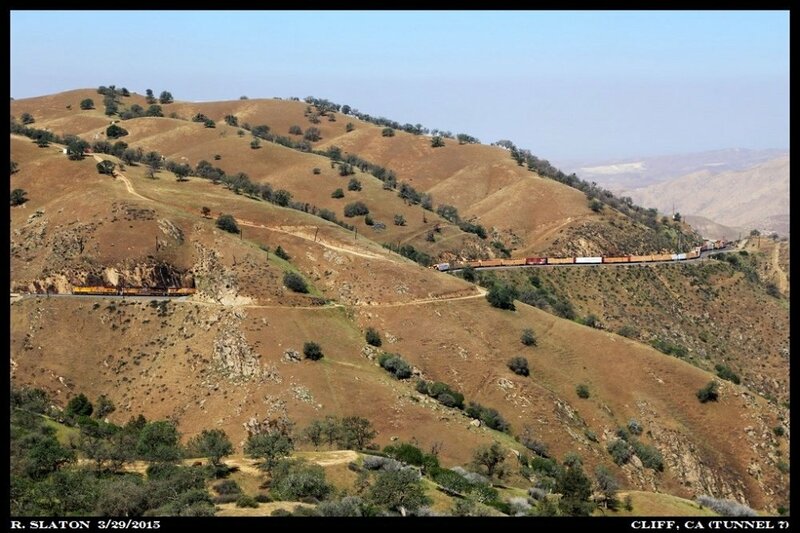 As maintenance and track forces are hard at work replacing rail on main 2 BNSF 7122 west carefully drifts by preparing for the long descent down into San Bernardino. # 5027: Up on Union Pacific's Mojave Subdivision (formerly SP's Palmdale Cutoff) it was business as usual. After catching a few more fleeted westbounds down at Cozy Dell I moved up towards Hiland on the Mojave Sub to catch a pair of Tehachapi bound trains which had new UP GE's on the point. First up was UP 8256 on the IWBOAX which had run around the UP 8212 at Canyon siding. Following 8256 out of Canyon and up the hill was a manifest led by fairly new C45AH 8212. 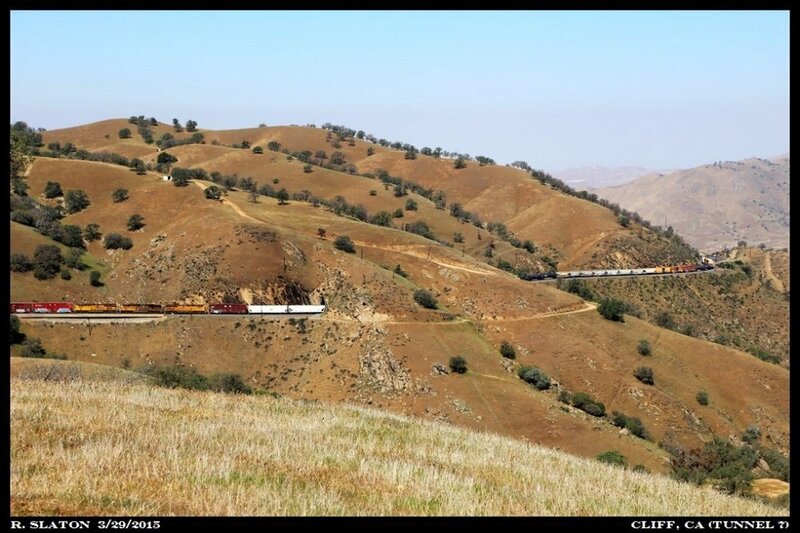 UP 8212-UP 2298-UP 4916 dig in as they round the curve leading into Hiland, the summit of the Cajon Grade nearly at hand. 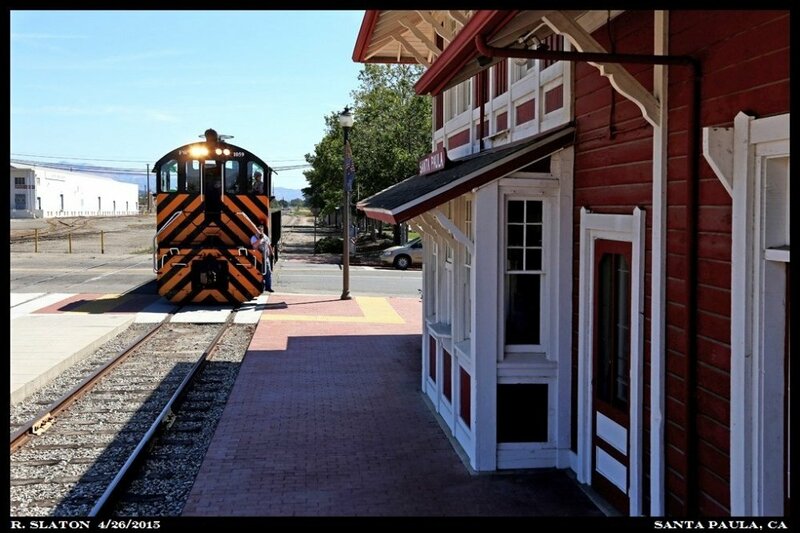 On the drawbar is the MWCFRX-18, an 'extra' West Colton-Fresno manifest. # 5008: Having topped the summit of Beaumont Hill back at Apex, CSXT 7319-CSXT 5404-CSXT 7823-CSXT 8545 drift through San Timoteo Canyon in between the timetable stations of Hinda and El Casco with the westbound ZATLC-18. CSXT 7319 is former Conrail C40-8W 6095. # 5009: Conforming to the serpentine curves of San Timoteo Canyon UP C45ACCTE 7492 and SD70ACe 8656 pilot the ZMQLC-20 (a Mesquite, TX to LATC, CA hotshot) down the western slope of Beaumont Hill near the former SP station of El Casco. 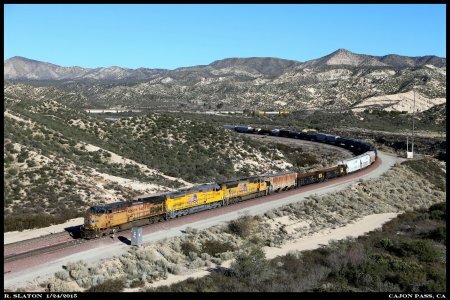 # 5010: Dropping down the Cajon grade east of Pine Lodge on main 2 UP motors 5746-9780-4844 hold back westbound tonnage bound for the West Colton, CA classification yard. UP 9780 sporting a fresh coat of armor yellow and a new battle flag decal started life as C&NW C44-9W 8676. # 5011: Well up until this point the email has been all 'downtown' ;-) Amidst the ever expanding urban landscape of Southern California the seemingly timeless sound of a hard working eastbound freight pierces the afternoon air in Redlands, CA on the western slope of Beaumont Hill near the timetable location of Bryn Mawr. Behind Union Pacific motors 8445-6878 the eastbound West Colton, CA to El Centro, CA manifest leave the 'cities' behind and prepare to crawl into the twisting canyon that is the western slope of Beaumont Hill. 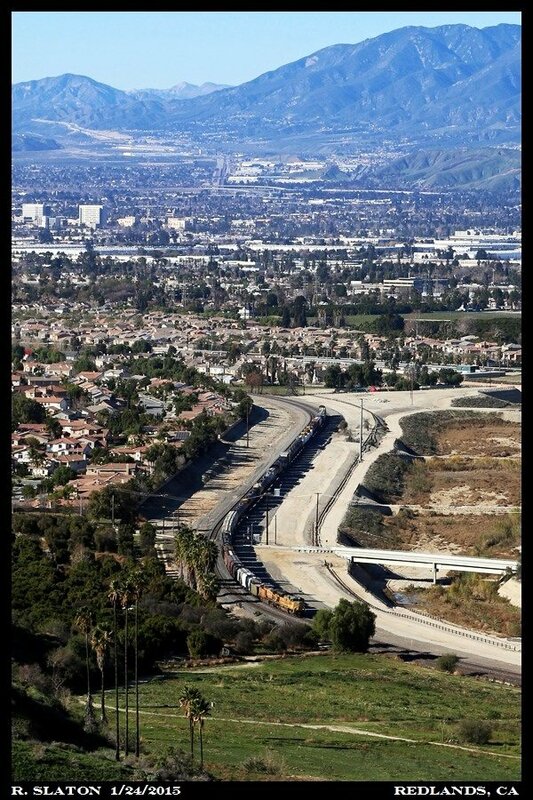 In the distant foothills the entrance to another fabled Southern California rail route, Cajon Pass, can be seen. A sharp eye can spot the Cargill elevator in Verdemont, CA. 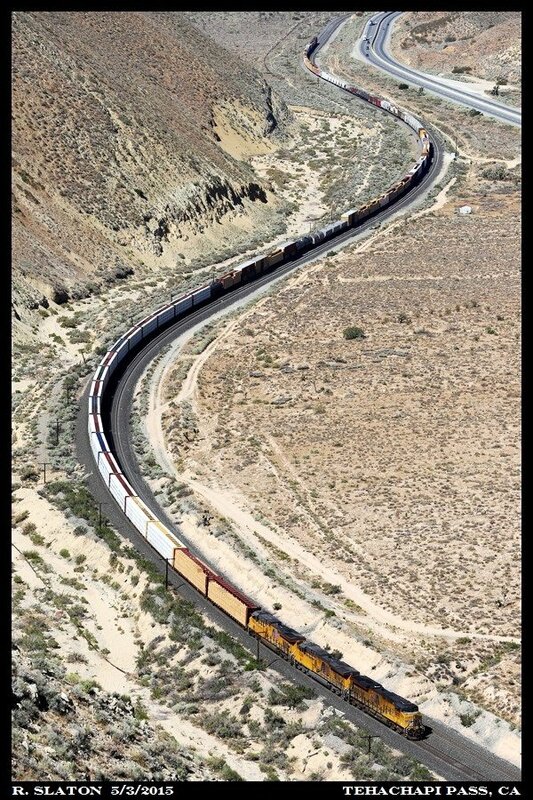 # 5012: Running up above the Mojave River wash and hugging the northern canyon wall a four unit brace of Union Pacific EMDs roll through the heart of Afton Canyon on Union Pacific's Cima Subdivision with the eastbound MWCNP-25 on the drawbar. 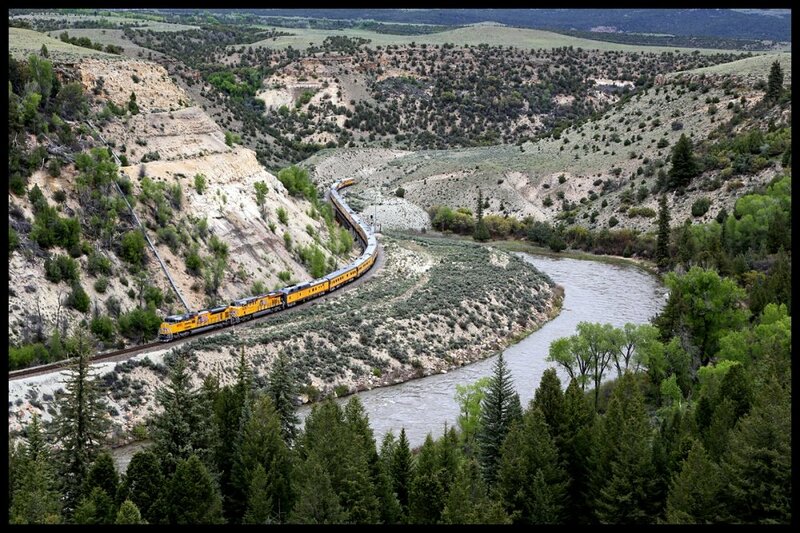 # 5013: Spotless EMD SD70AH 8932 holds back the westbound Robertson ready-mix rock train as it slips down the western slope of Beaumont Hill above the former station of Ordway. On the east end of the train is equally clean SD70AH 8925. For anyone unfamiliar the SD70AH is basically a SD70ACe however the AH stands for 'heavy'. 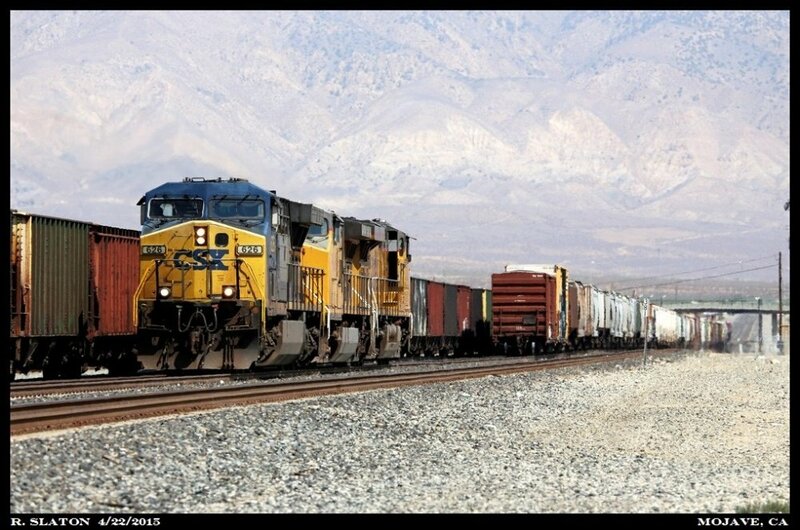 The units have extra ballast adding to their overall weight to aid in traction. Union Pacific is the first to own 'heavy' SD70s however both UP and CSX own GE's heavier version of the ES44AC. 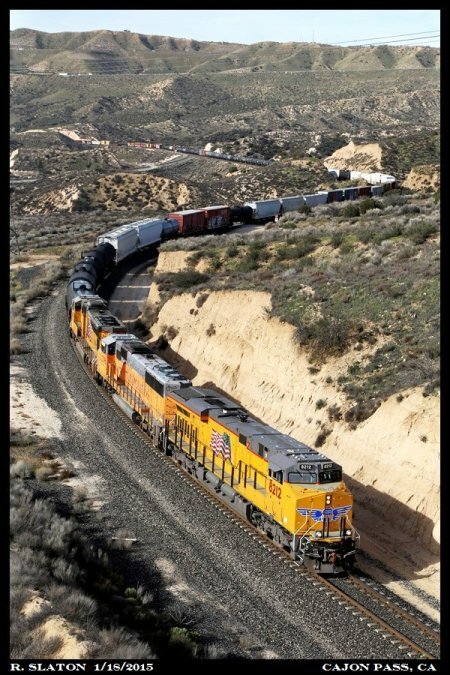 The Robertson rock train which is loaded at Robertson, CA (just west of Cabazon) on Union Pacific's Yuma Subdivision runs down to Gardena, CA for unloading. After spending the last few weekends down on Cajon and Beaumont I made a trip to Tehachapi on Saturday to inspect the green hills I ordered for this Spring. The resent rains have done wonders for the hills and with any luck there will be more rain to come. Our latest storm system here in Southern California was still moving around on Saturday, during the morning hours it was moving out but by the afternoon thick clouds were again rolling over the mountain making for an interesting weather day. Work crews had the day off so there were no work windows to hold up trains making for a pleasant day to be trackside on the mountain. # 5014 Pulling out of the departure yard it may appear that UP's Mira Loma hauler is about ready to make the 'jump to hyper-space' but it is actually crawling around the balloon loop in West Colton. 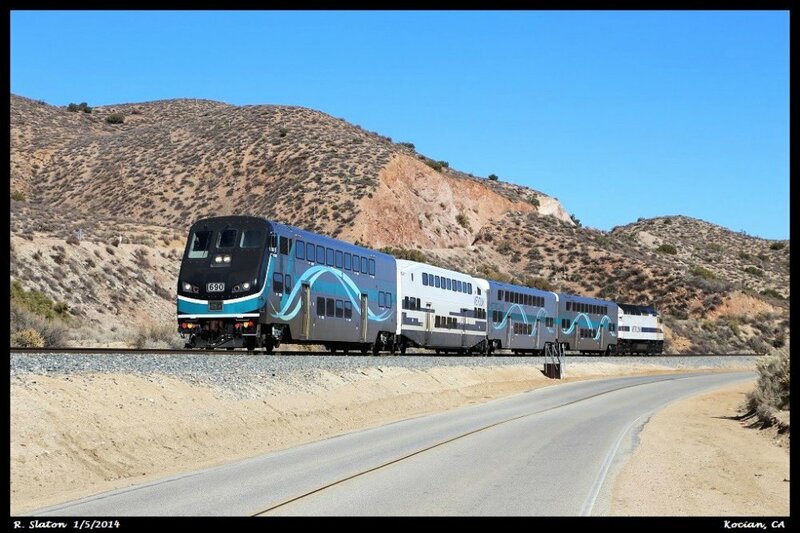 Having changed directions from east to west the train will take the Alhambra Subdivision (exSP) to Pomona where the power will swap ends before heading east down the Los Angeles Subdivision (ex LA&SL) to Mira Loma. 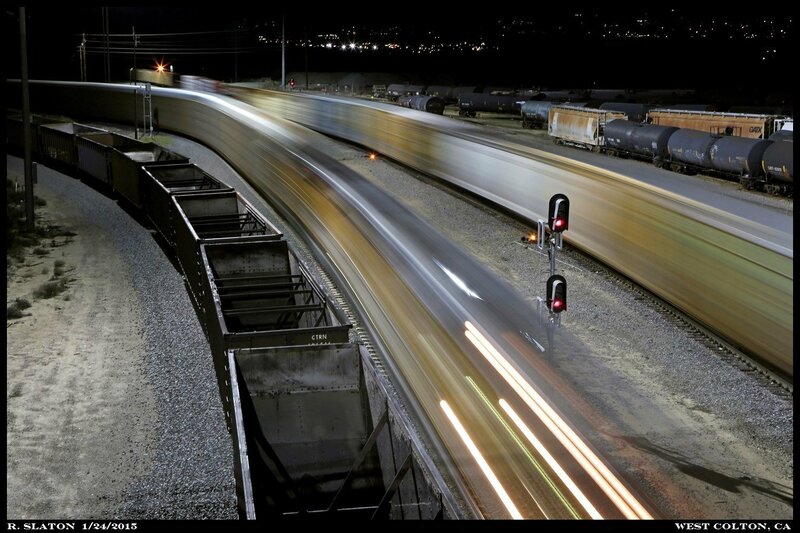 The day's LOQ47 is powered by a trio of EMD SD60Ms led by 'triclops' 2411. 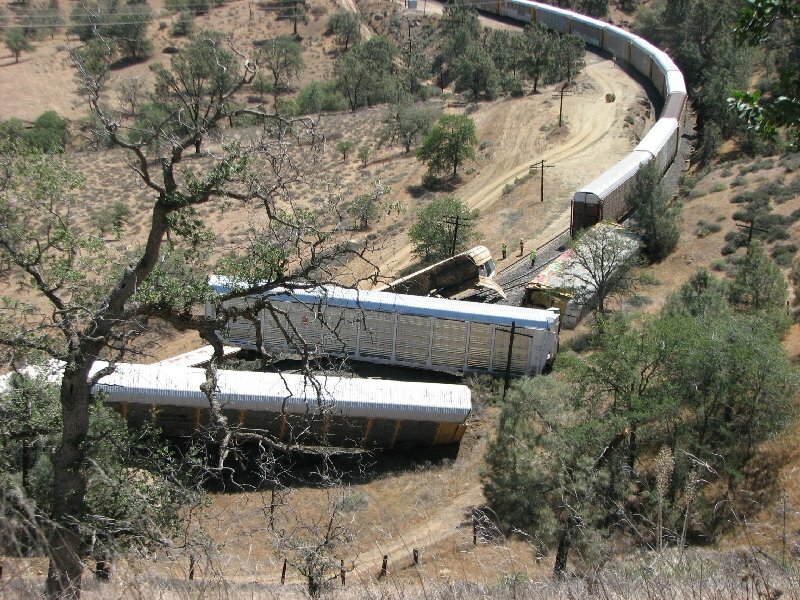 # 5015: 484 axles worth of Union Pacific's eastbound QRVWCB-30 are at the mercy of gravity as the lumber heavy drag is brought up Tehachapi's western slope by 5 modern UP GEs. The head end, UP 8129-5378-7408, on this eastbound is now on the lower leg of the Bealville horseshoe at the west end of Bealville siding, this being the former location of Allard siding. In the distance at right UP 5438-5425 are shoving the rear of the train across the landfill that spans the gap between Tunnels 1 and 2. 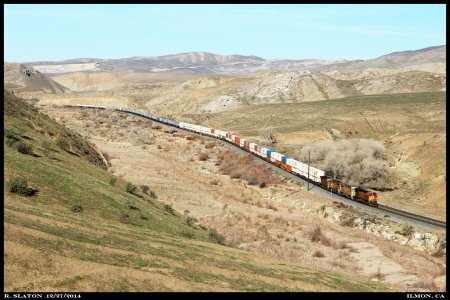 # 5016: Having just topped Tehachapi Summit UP's eastbound MFRWC (Fresno-West Colton manifest) rolls through the new high-wide defect detector just west of Monolith. As of this writing the high-wide detector at MP 363.8 is still in service for both mains...this new detector is at roughly MP 364.2 on the Mojave Sub. # 5017: Just after sunrise UP SD70M 2002, one of two SD70Ms commemorating the Salt Lake City Winter Olympic games, prepares to roll down off the Lytle Creek bridge with the 'Brooklyn Trailers'. This is on the former SP Palmdale cutoff (UP's Mojave Subdivision) in the foothills of Cajon Pass just north of San Bernardino. 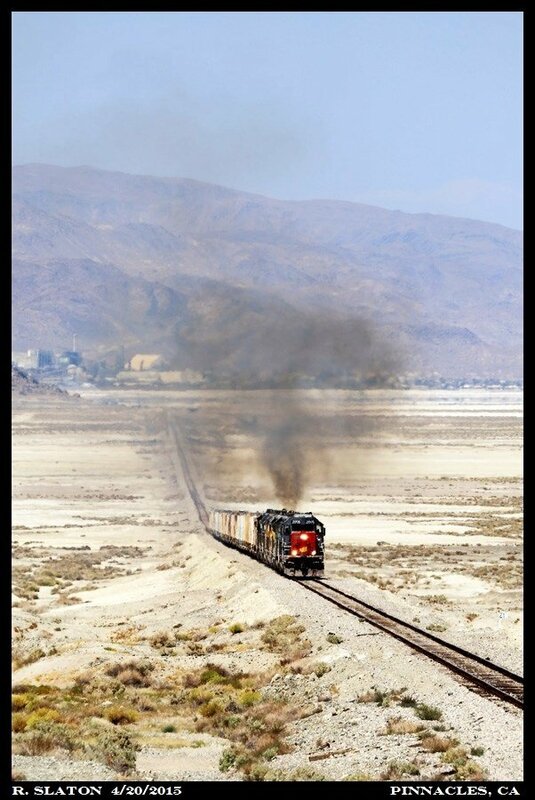 Several weeks ago a friend of mine approached me about doing a trip out to Trona, CA to photograph the Trona Railway. 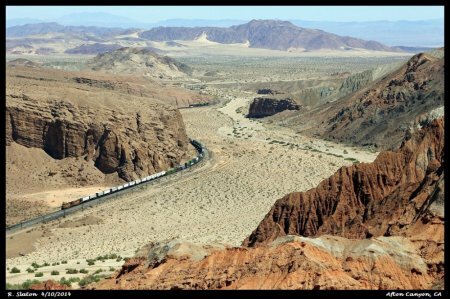 He had never been out to the remote Southern California short line and having only made a handful of trips myself I was certainly up for another trip to the Searles Valley as soon as we could coordinate a date. 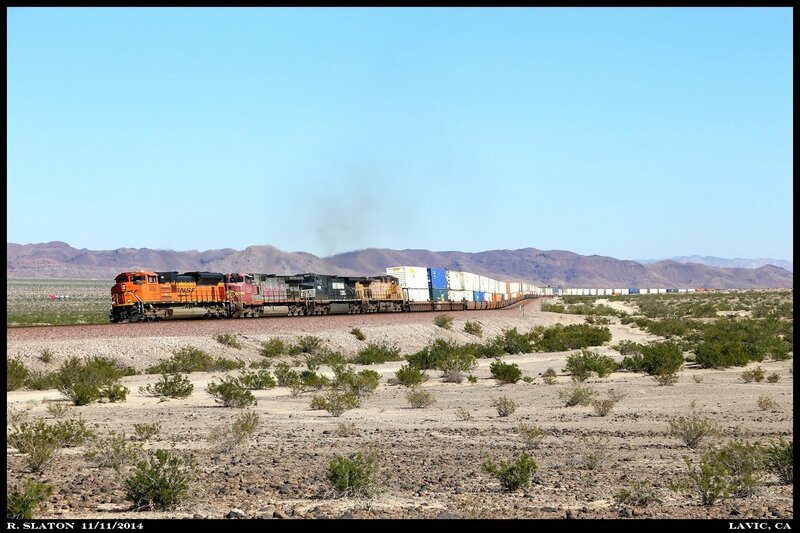 Since we both had President's Day off we made our way out to Trona on 2/16/2015 pausing briefly Monday morning in Boron to photograph BNSF's Boron Local as it was preparing to shove out to the Borax plant northwest of town, but those photos are for another day. Below are a few photos from our day along the 'Trona Road'. This is about as desolate an area to run a railroad as you can get and a stark contrast to other urban Southern California hotspots. 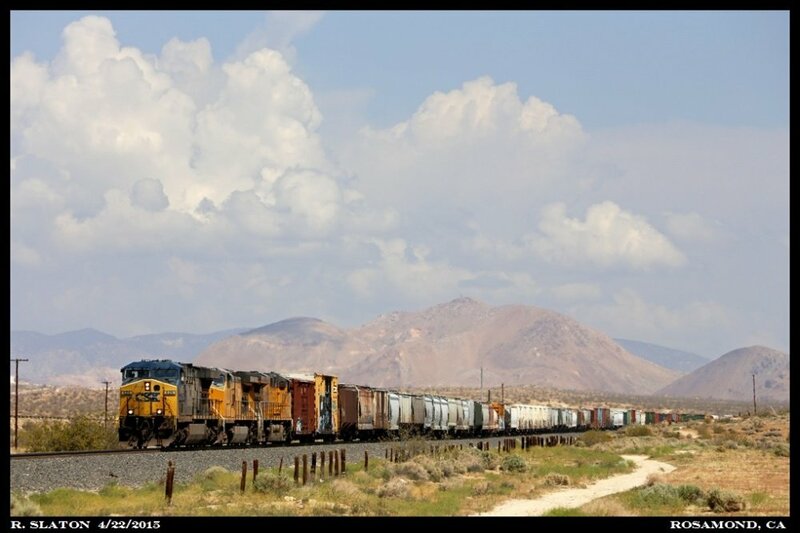 The beauty of the desert mixed in with classic EMD machines make for a very interesting day trackside. For anyone who has never been, it is worth a trip. 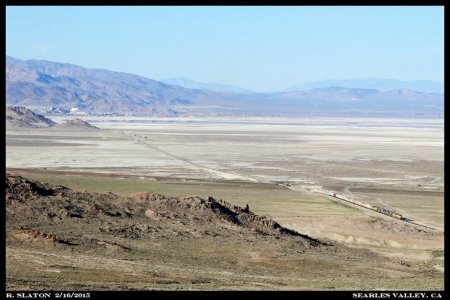 Situated between the Argus and Slate ranges is Searles (dry) Lake on the western side of which the Trona Railway serves the Searles Minerals Company's processing plants which mine the various and numerous elements found under the Lake's crust. 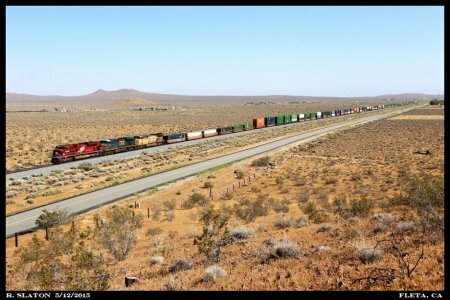 It is through this barren desert land that the Trona Railway drags tonnage out of the Searles Valley and up to a interchange with the Union Pacific (originally Southern Pacific) in Searles, CA. At Searles the products from the Trona mines are further taken to customers both domestic and export in an operation that has been ongoing since 1914 when the Railway was completed. 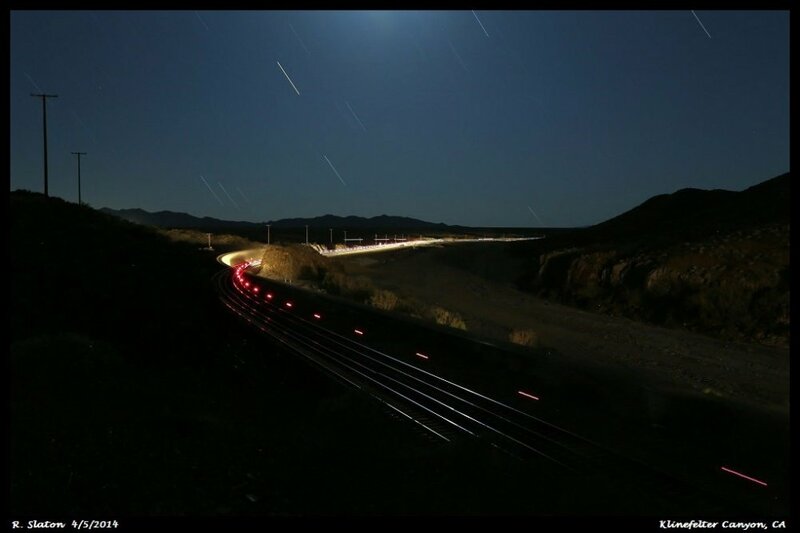 # 5040: Having plenty of time to ponder over the history of the Trona Railway while we waited it was just after 1500 that a distant headlight could be seen peaking into view at Oxy. It is just passed the small storage yard at Oxy where the Trona Railway encounters a stiff uphill grade that will remain for the next 26 some miles on up to Searles. 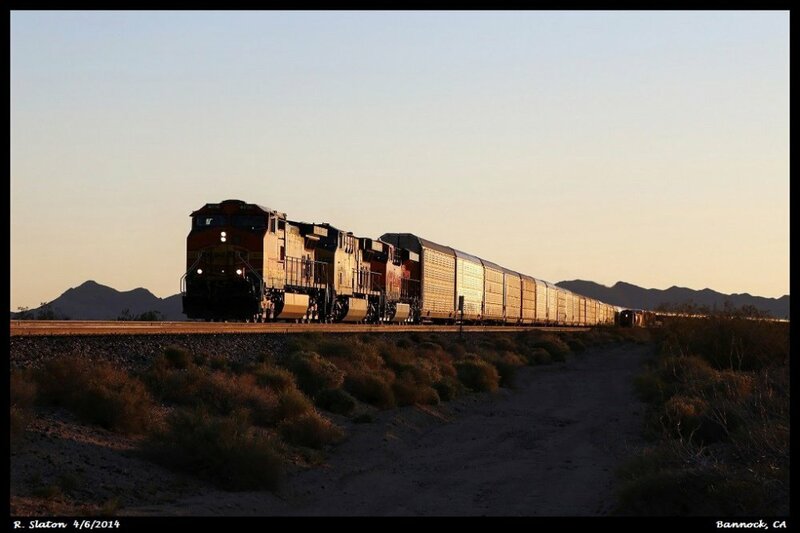 As the distant headlight approached Pinnacles the classic pulse of EMD 645s began to beat the previously silent air as the westbound potash train prepares to leave the Searles Valley. 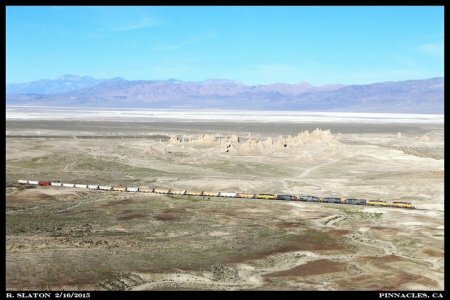 # 5041: Continuing the pull upgrade the westbound train with 17 potash loads is all stretched out behind Trona Railway's 7 road locomotives. These include (in order): TRC SD40-2 2009, TRC SD40-2 2007, TRC SD40T-2 2005, TRC SD40R 2002, TRC SD40T-2 2006, TRC SD40T-2 2004, and TRC SD40-2 2008. Rising above the Valley in the background are the Trona Pinnacles rock formations, a California Natural Landmark. # 5042: After leaving Trona we made our way up to Garden City...where there is no garden nor a city :-) Garden City was once a station site on the Trona Railway just east of the Searles connection with the Jawbone branch (Lone Pine Branch). 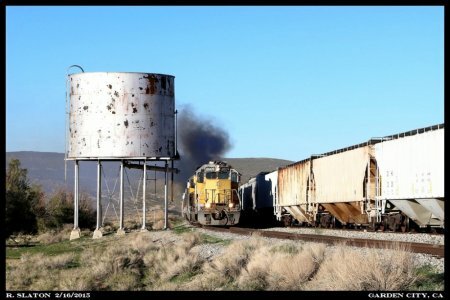 Fighting up the final approach to Searles the westbound train passes the former Garden City station site and water tank that once fed Trona's steam locomotives. The station is long gone however some of the foundations remain as does the old siding, now used to store hoppers. Upon arriving at Searles the Trona Railway dropped the cut of potash loads in the small interchange yard. 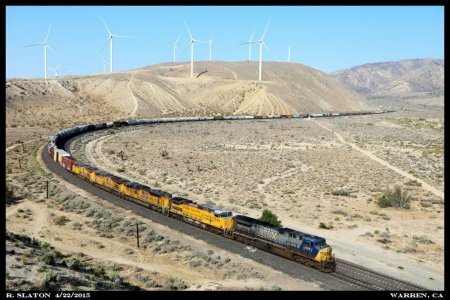 Afterwards they ran around to the east end of the yard and split up the power in order to double a loaded coal drag back to Trona. Four of Trona's motors would tie onto the 'first section' of the CSKTR (Skyline, UT to Trona, CA Coal) while the remaining three motors were spotted behind the Potash train they had just brought up from Trona. 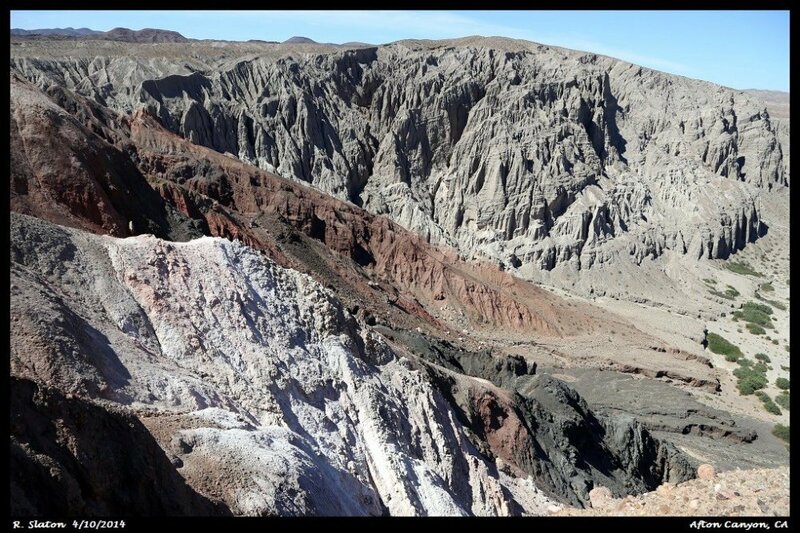 After the crew had taken the 'first section' down to Trona we believe they were bused back up to Searles to pick up the 'second section'. # 5044: Just as the sun slipped below the distant skyline the desert was still aglow as it was time for the TRC 2008 east to highball Searles. 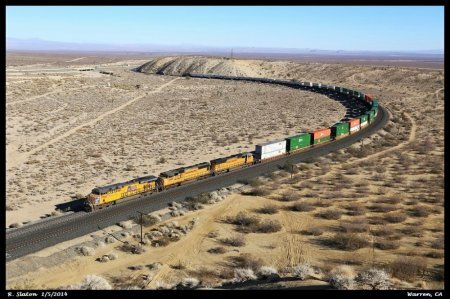 As the train prepares to roll across Searles Station Cut-off Rd the desert will soon be filled with the whine of dynamic brakes as the train makes the decent back into the Searles Valley. To the left of the 'yard ladder' is a remaining portion of the old SP Lone Pine Branch that once ran out to its namesake city. 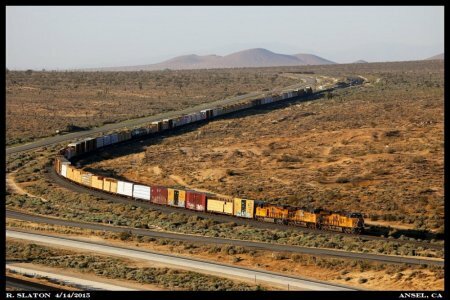 Today only a few miles remain of the branch east of Searles and it is used to park trains awaiting pick up by Union Pacific. 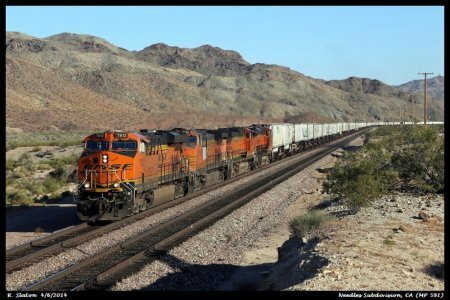 RS 3/08/15 BNSF 6715 EB at Pine Lodge - 5054 # 5052: I spent most of the afternoon hiking on the Mormon Rocks that overlook Union Pacific's Mojave (ex-SP Palmdale-Colton cutoff) & BNSF's Cajon Subdivisions (mains 1 & 2 'north tracks'). Standing up on the top of one such Mormon Rock offered a fine view of the railroad action on either of the three before mentioned mainlines. 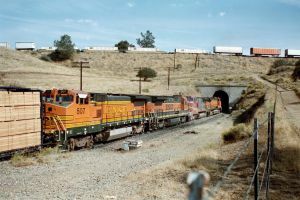 After a brief wait a westbound BNSF manifest came into view emerging from the cut at Alray where Tunnel 2, one of the two Cajon Pass tunnels, once stood. 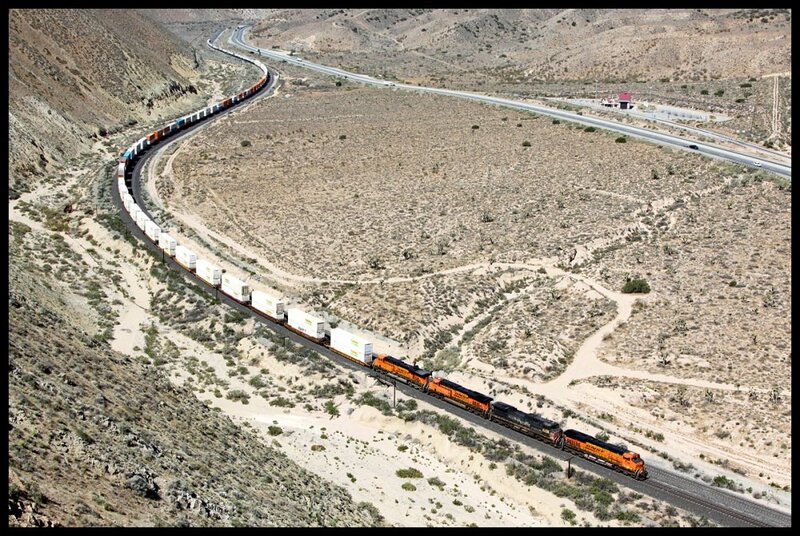 After slipping under Interstate 15 the westbound is at CP Walker, named after long time Santa Fe employee Chard Walker. # 5053: With dynamics howling and flanges squealing the westbound manifest, entrusted to a 5-pack of 7700 series ES44DCs (7704-7713-7706-7761-7776), roll their westbound through the horseshoe curve west of CP Walker. 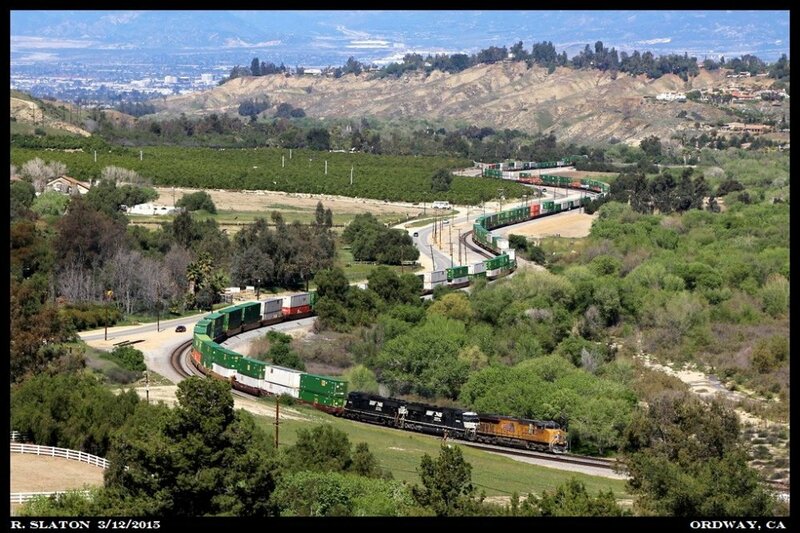 Now the train is approaching the former station of Pine Lodge as the great decent into the LA Basin continues. # 5054: After awhile I situated myself on another of those trademark Mormon Rocks that line the western slope of the Cajon Grade. After waiting for a little while for an eastbound one finally came along. 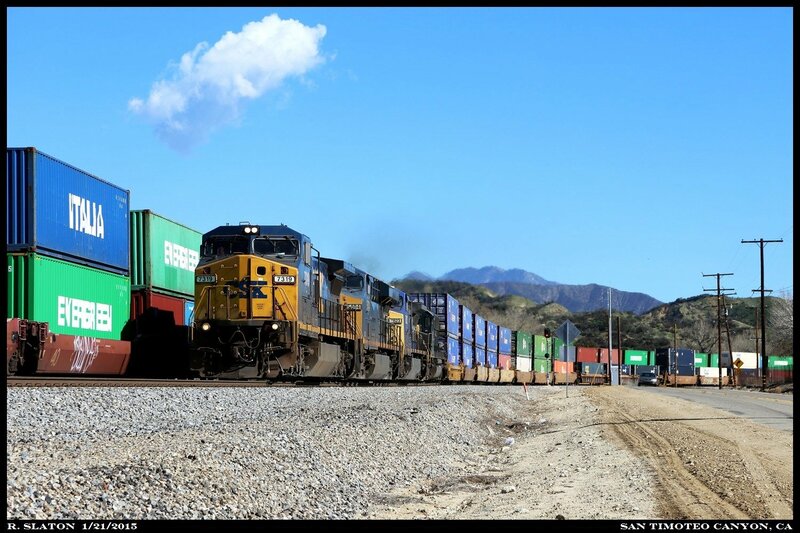 Four big GE machines (6715-7028-5445-7763) walk the eastbound stack train elephant style up the Cajon Grade at Pine Lodge passing under CA-138 and over a dry wash in the process. With no real plan of what to do with the day before and after catching the NS 1074 I left it up to the trains to tell me where to go. It was a beautiful day in Southern California to be trackside, here are a few results from the day's activities. 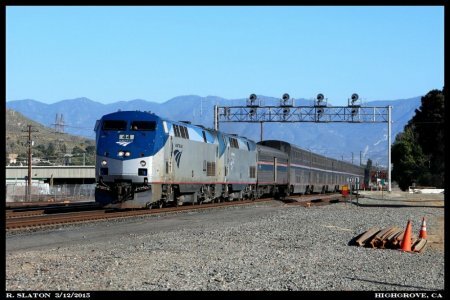 # 5045: No sooner did I arrive in Cajon Pass Thursday morning I was greeted by a late running Southwest Chief which I ended up following down Cajon and into San Bernardino. Taking advantage of #3's San Berdoo station stop I made my way down to Highgrove where BNSF's (former Santa Fe) San Jacinto branch diverges off the San Bernardino Subdivision. After a few minutes of waiting #3 flew through town behind motors 44 and 81 en route to Los Angeles with intermediate stops in Riverside and Fullerton yet to make. 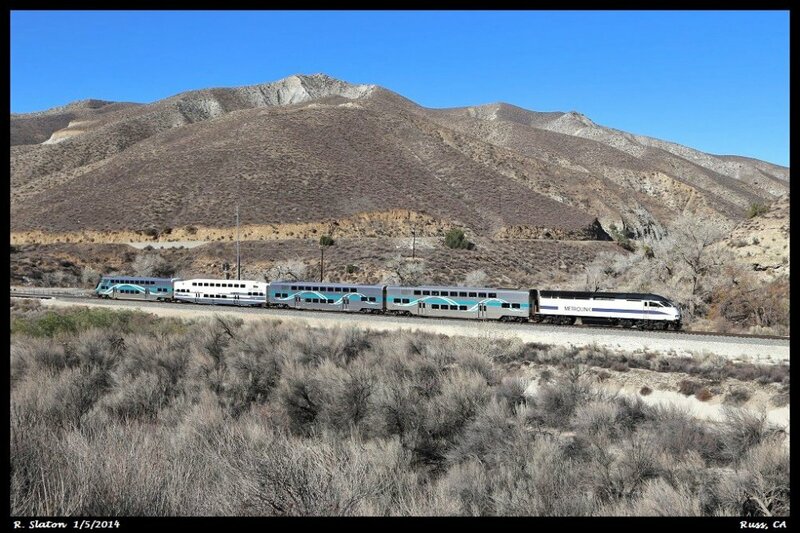 # 5046: After catching Amtrak in Highgrove reports that the ZLCAI was out of LA and heading east towards West Colton had me moving towards Beaumont Hill as well. Upon arriving at Ordway I got some elevation above Union Pacific's Yuma Sub to wait on the ZLCAI. Eastbounds were on parade Thursday morning which provided me with a few 'warm up' trains before it was the ZLCAI's turn to work up Beaumont Hill. 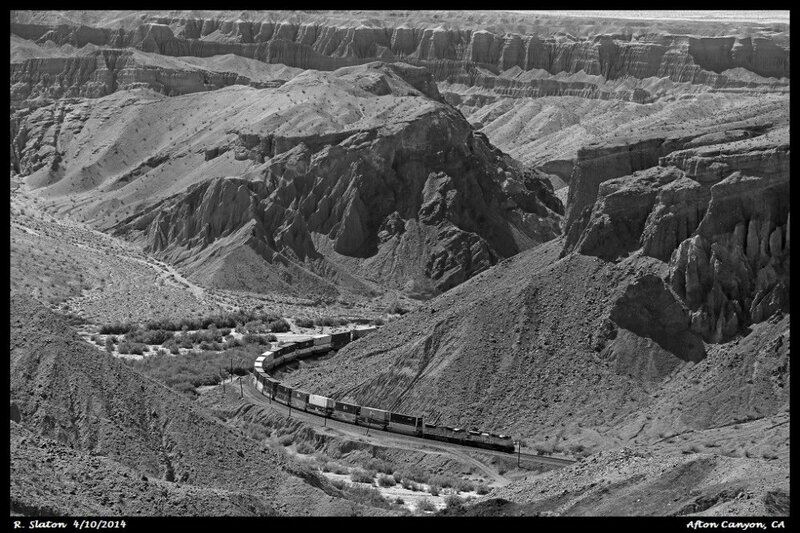 Contending with gravity and the serpentine curves that are a trademark of Beaumont Hill's western slope the eastbound ZLCAI leaves Ordway behind UP C45ACCTE 7939-NS SD75M 2802 (ex-ATSF 218)-NS SD60E 6971. # 5047: East of Ordway a curve gang was hard at work on main 2 which required that passing trains slow to a restricted speed, this provided me with ample time to get back to the car and get out ahead of the eastbound Z. I had to stop and take advantage of the Centennial bridge west of Beaumont, CA for a few roster shots...here is one of NS 1074 which was the ZLCAI-12's lone DPU. # 5048: I hadn't really thought of following the ZLCAI east of Beaumont but after talking with a few friends I decided what the heck and continued to push east towards Indio and the Salton Sea. 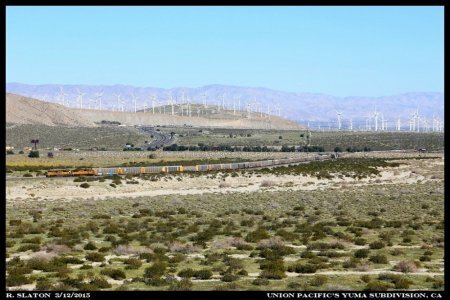 It has been several years since I have been trackside east of Palm Springs so I was interested to see what the area east of Indio looked like these days now that UP is working to double track this portion of the Yuma Subdivision. 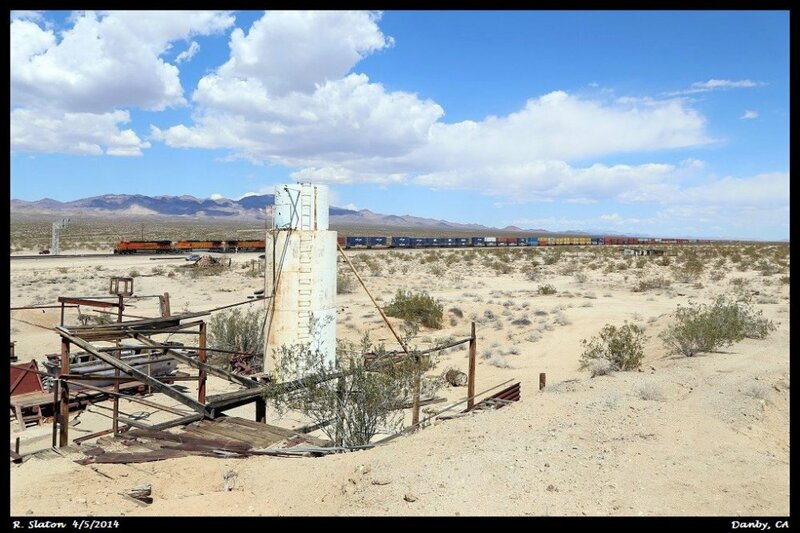 Currently the western end of double track along the Salton Sea can be found at the former SP station of Ferrum, which was once the interchange point with Kaiser Steel's Eagle Mountain Mine branch. 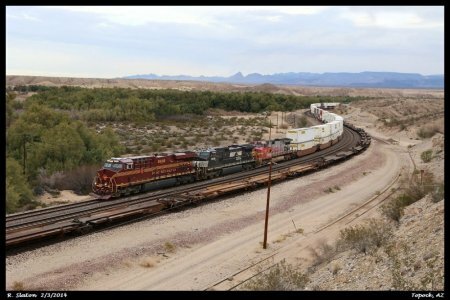 What would have once been the west end of Ferrum is now CP Salton, which is where UP 3978 west found itself, holding for a eastbound stack train led by UP 7526. # 5049: UP 3978, ex-SP SD70M 9804, was the lead motor on a westbound 'Tropicana' Z train, 3978 was also sporting a short lived version of the UP paint scheme which features a lower lightning stripe and grey paint below the cab windows. 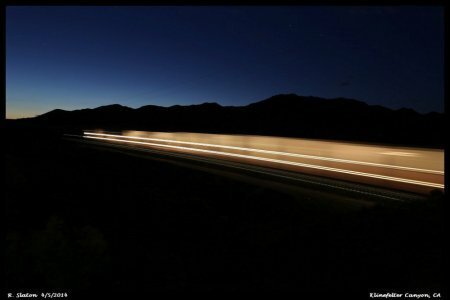 I ended up following this train back west, trying to catch it passing as many of the few remaining searchlight signals as I could. A big fan of the searchlights I was somewhat surprised to find the handful of searchlights between Thermal and Mortmar, I figured by this time they would all be replaced. Rattling over the east switch at Mecca UP 3978 will briefly pause once more at the west end of Mecca for a meet before getting a clear path to Thermal where double track resumes for the run west to West Colton. # 5050: Pushing west I came upon a slow moving westbound auto-rack train ahead of the UP 3978 which was having a tough time contending with the eastern slope of Beaumont Hill. Between Cabazon and Garnet I did some wandering in the desert and found a little hill to hike up on. It wasn't quite what I was looking for but I guess it is a different take on the situation. With a pair of EMDs, led by 8755, slugging it out on the point the westbound racks have just passed under the CA-111 overpass west of Garnet with one of many windturbine farms in the area visible in the background. # 5051: After cresting Beaumont Hill at Apex the 3978 was run around the slow rolling auto-racks and made a nice late afternoon run down Beaumont's western slope, also known as San Timoteo Canyon. Taking in the late afternoon sun the 'Tropicana' Z slips through the snaking curves near the former SP station of El Casco surrounded by the nicely greened 'Spring' hills that line Union Pacific's Yuma Subdivision. # 5055: Starting the morning hike right around 0700 in the cool of the morning just before sunrise I was alerted to a northbound covering the crossings up at Cliff so I set up to take a few photos of the train rolling into Caliente. Easing down the top leg of the Caliente horseshoe BNSF-NS-BNSF-CSXT GE's hold back their stack train as a Union Pacific drag waits on the opposite leg of the horseshoe in 'downtown' Caliente. This BNSF northbound (westbound back in SP days and westbound once it rejoins home rails in Bakersfield) was one of only two northbound movements I would see during the morning hours. # 5056: Following the UP manifest seen in photo one up the mountain was a parade of southbound trains which kept me busy for the rest of the morning. Right behind the UP manifest was a BNSF train sporting warbonnet clad C44-9W 715 on the point. 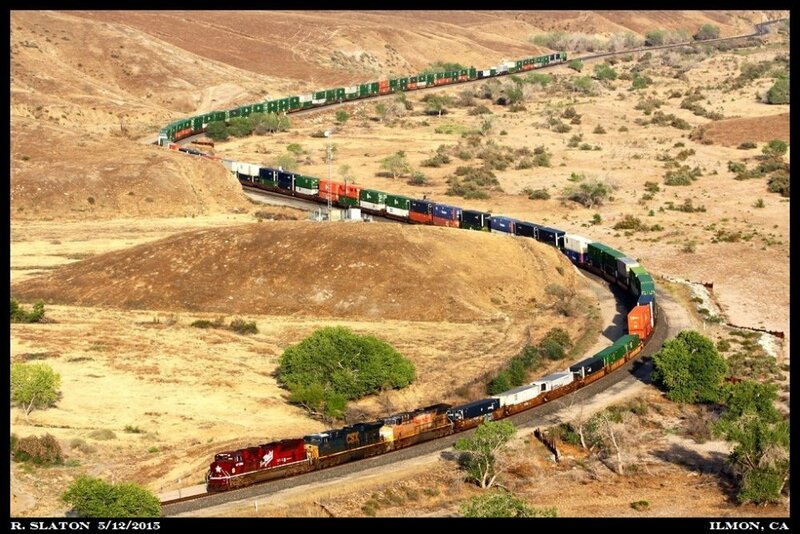 715 along with 3 younger GEs, including one C4 that appeared to be right off the show room floor, are rounding the Caliente horseshoe curve as they prepare for the near 600' climb that in just over 6 miles will take them to Cliff in one of the most amazing shows a fan of mountain railroading will witness out west. # 5057: The 2nd northbound move I caught later in the morning was a UP light power move which couldn't have been much lighter. 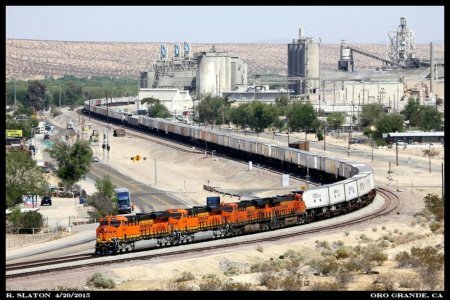 Lone C44AC 6185 (ex-SP 137) rolls down into Caliente as a BNSF manifest holds in 'downtown'. 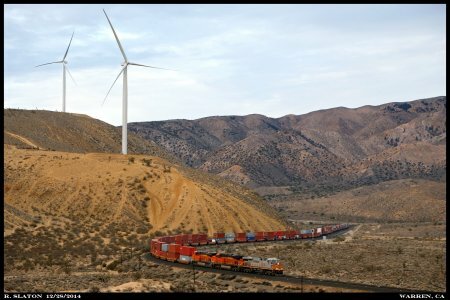 Earlier in the morning as I was driving up to Caliente I spotted a UP manifest at Cable which had 3 motors on the point and another 3 on the rear. 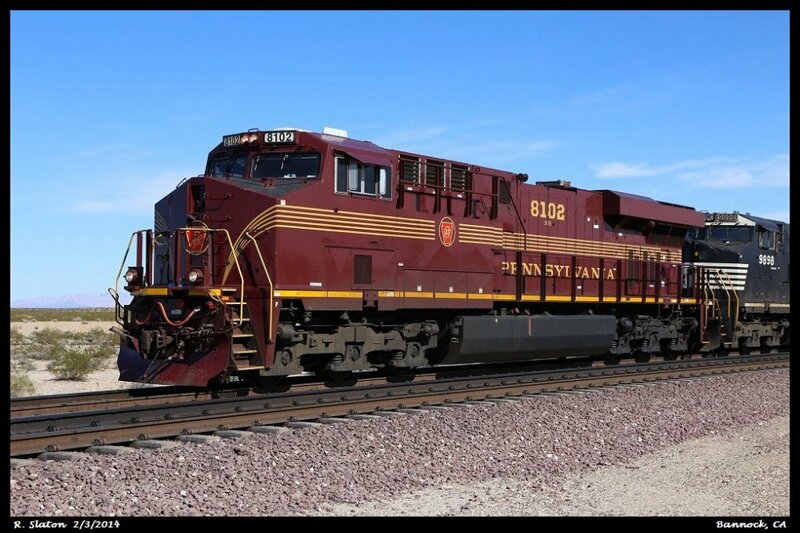 If I saw things correctly I believe 6185 was one of the 3 motors on the rear. It may have been called out of Bakersfield as a manned helper to assist the UP manifest up the mountain. 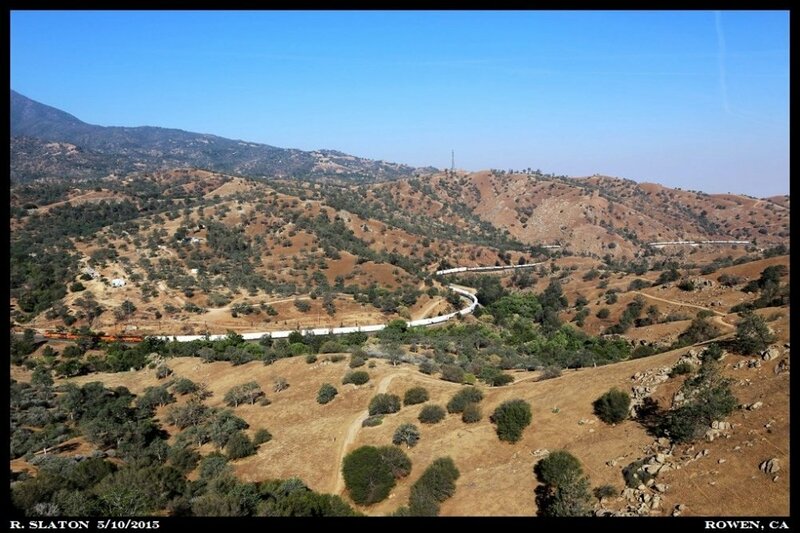 Last Sunday (March 29th) was predicted to be a beautiful day here in Southern California so with this in mind I made the short drive up to Tehachapi for the day. 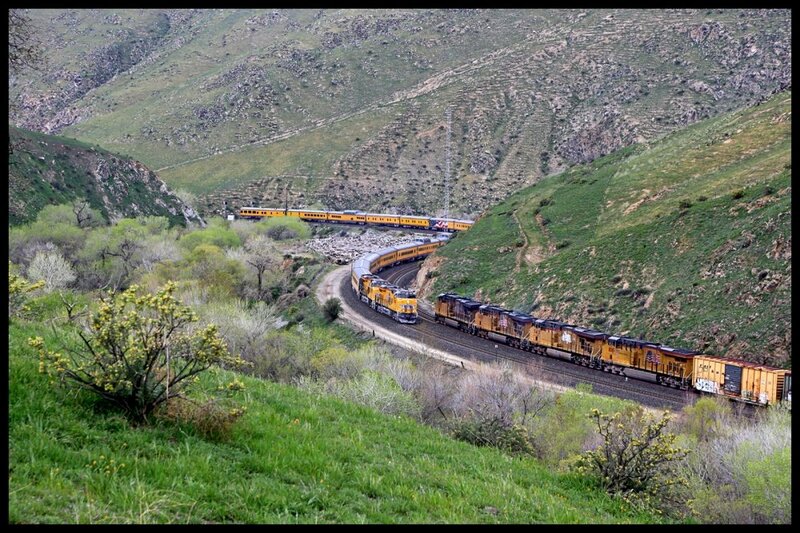 Getting up to Keene about 0630 I began a hike down the Tehachapi Creek with the intention of getting some photos of Union Pacific's Mojave Subdivision suspended high above the creek along a somewhat remote stretch of the famous mountain pass. 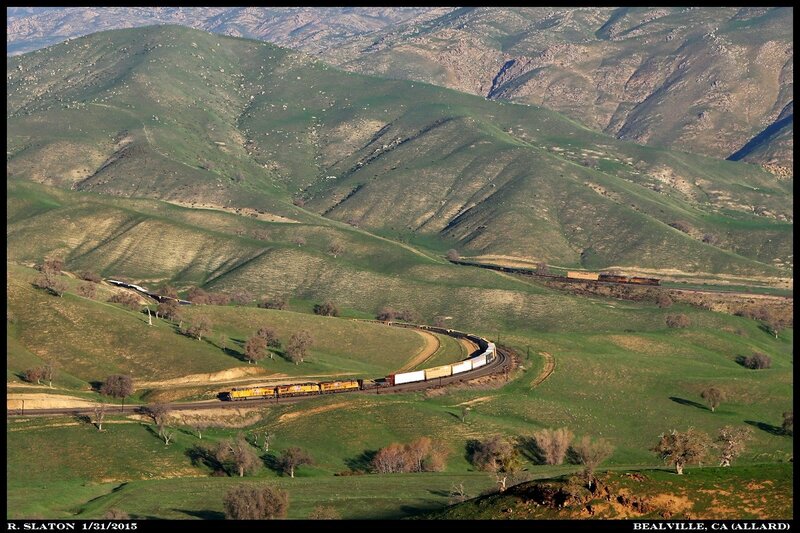 With only a light breeze it was indeed a wonderful day to be on Tehachapi and moreover the trains were running. As I was following the creek downstream talk on the scanner of a broken rail between Rowen and Cliff caught my attention. 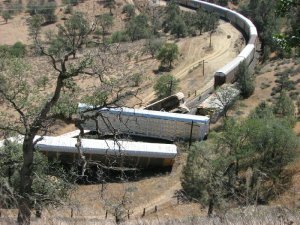 As I got some elevation on a nearby hill side north of the Tehachapi Creek I caught a glimpse of a UP boom truck hi-railing towards the break. By 0800 the rail was repaired and the mountain was open for business. Union Pacific's hotshot ZLCBR was held up by the break at Woodford and was first out of the gate after the break was repaired. Following the ZLCBR down the mountain was a fleet of 4 more northbounds. 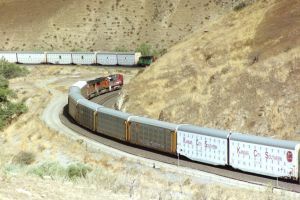 There were a few more northbounds but they were held as it was now time to get southbounds up the mountain, starting with a trio of back to back Union Pacific trains. Attached are three photos of the first southbound out of the gate Sunday morning. 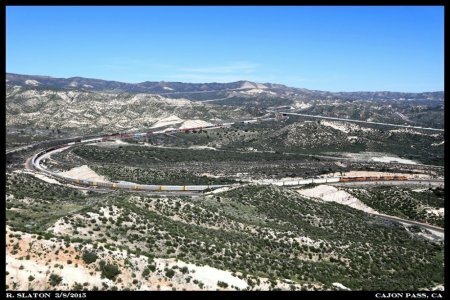 # 5058: Having fought its way out of Caliente, nestled nearly 600' below in the valley at right, the first southbound for me Sunday morning was UP's lumber heavy QRVWCB-28. Suspended high above the Tehachapi Creek on a narrow cliff side which very appropriately is identified by the name Cliff in the timetable. 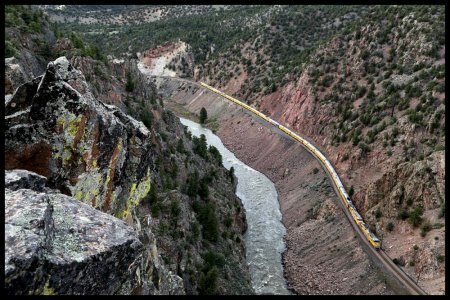 The train is passing the top end of the siding at Cliff which stretches for 7530' along a slightly wider but just as precarious right of way. 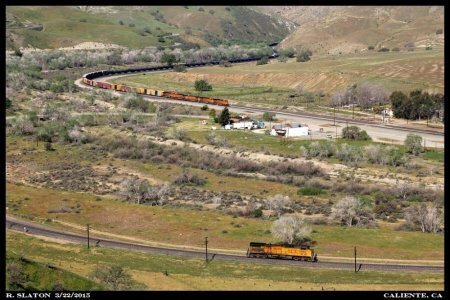 # 5059: A few moments later the thunderous roar emitted from the hard working GEs again fills the Tehachapi Creek valley as UP 8068-5472-5464 burst out of Tunnel 7. 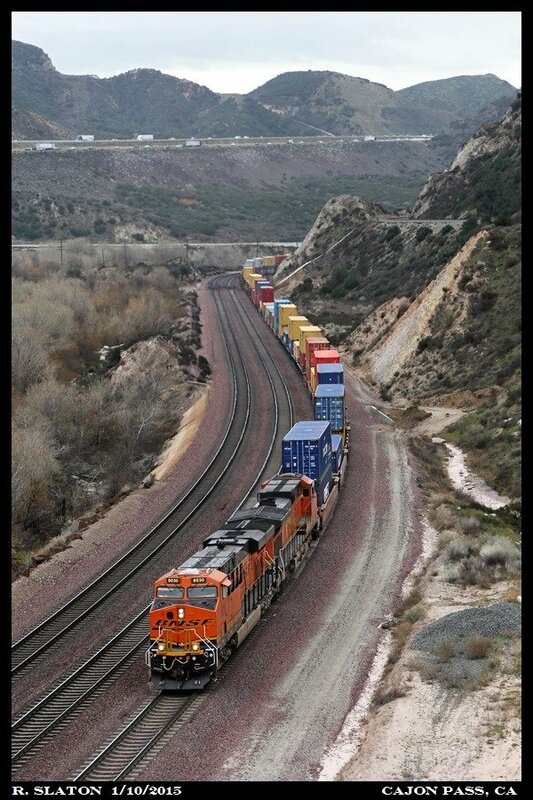 # 5060: Aiding the lumber heavy QRVWCB in its fight with gravity UP 8094-5425-7937 echo the roar emitted by their head end counterparts, also just out of Tunnel 7. They say that 'beauty is in the eye of the beholder' and while in some cases beauty might be universal, in others....not so much. 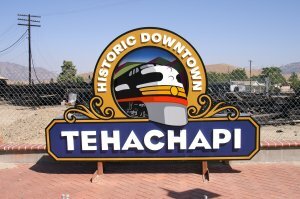 Tehachapi fits that latter category. 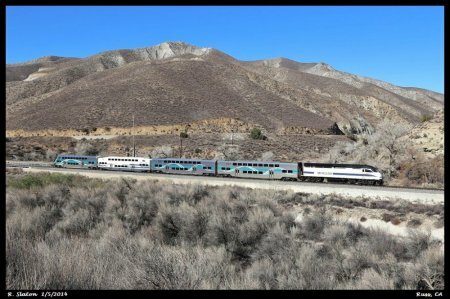 To some Tehachapi might seem like a overly photographed land where 'dead' brown hills and spotty tree cover is the backdrop to a sea of increasingly uninteresting modern motive power. 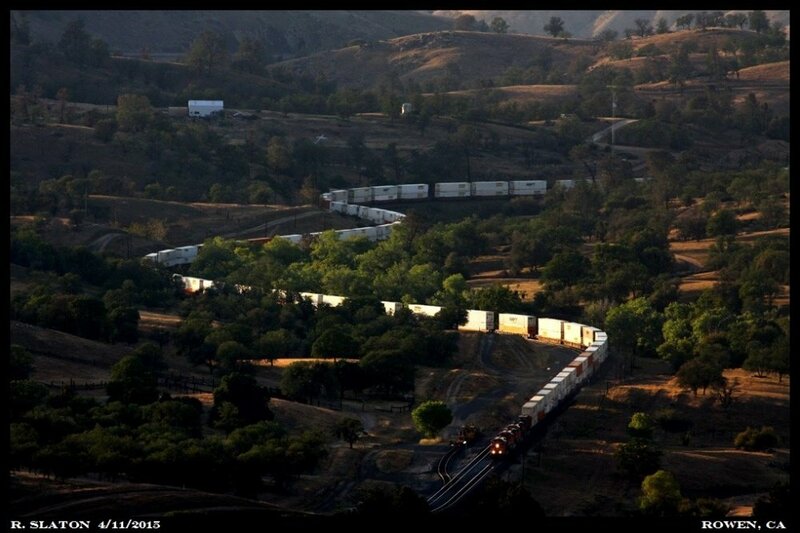 But to this fan there isn't another railroad route that commands a irresistible lure quite like 'Snake Mountain'. 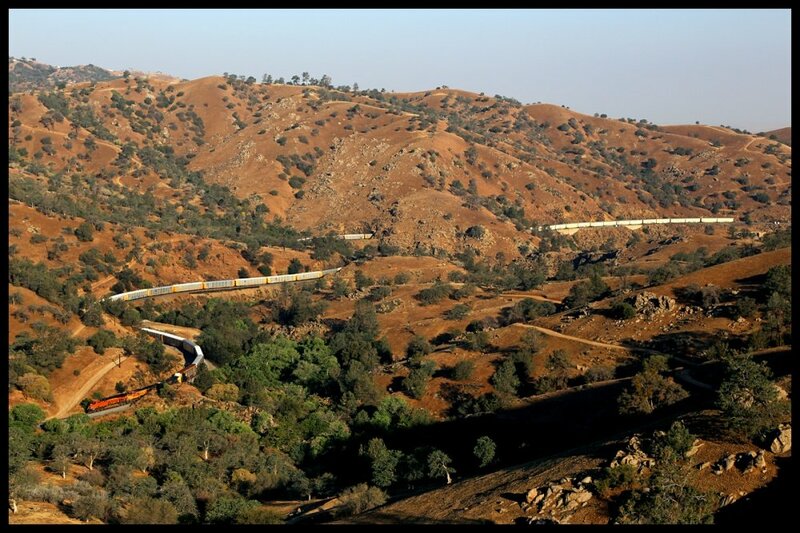 Nestled at the southern most extension of the Sierra Nevada range the Tehachapi mountains proved a seemingly impassable challenge when Southern Pacific started up the mountain range in 1874. Through a series of marvelous track alignments Southern Pacific carved a railroad through the mountains, taking their railroad from the San Joaquin Valley and on towards Los Angeles. 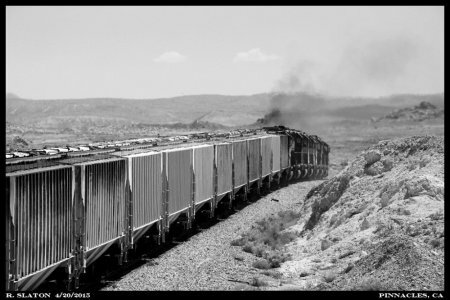 Today's railroad is much the same as it was in the early days. Of course over the years motive power changed from steam to internal combustion, signal systems replaced train order operations, and of course the two tenants that were once the rule on the mountain have given way to the modern entities that we see today. But one thing that remains unbroken is the amazement that Tehachapi continues to inspire in those who stand track side to watch today's modern railroads wage the timeless battle with gravity to lift trains up and over the mountain. Below are trio of images taken on Saturday April 11th, 2015 during an annual Spring get together between George (gjc), Curt, 'Metal' Mike, and myself. 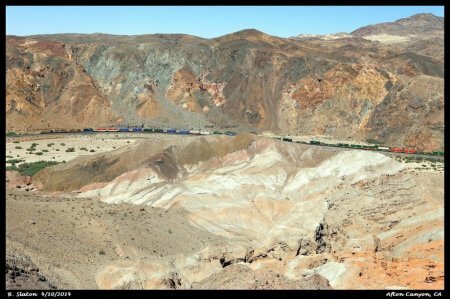 This was the last full day of our 2015 trip when trains were in no short supply throughout the day, keeping our focus firmly fixed on the mountain. 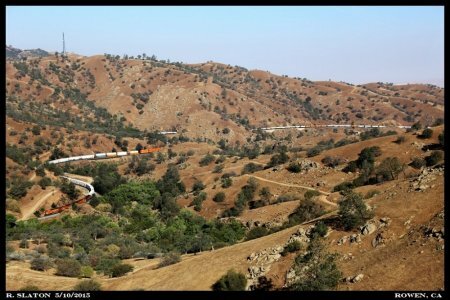 # 5077: Amidst the golden hills and seasonally green trees BNSF's hotshot Z WSPNBY is carefully piloted down the western slope of the Tehachapi grade at Walong, more commonly known as the Tehachapi Loop. Today's train has drawn ES44C4 6694, C44-9W 4752, SD70MAC 9753, and C44-9W 4601. While the train's head end is preparing to begin the swing back under itself the rear end is still emerging from Tunnel 10 on the upper level of the Loop. # 5078: Impersonating a snake the hotshot Z is coiled up over itself as it continues the decent down the mountain. 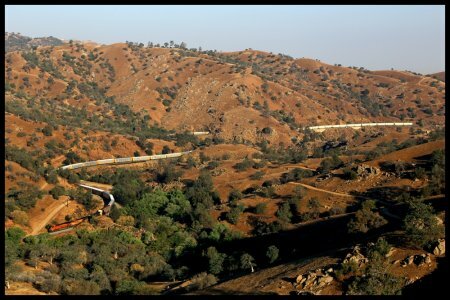 The elevation gained/lost between Woodford and Marcel is yet another example of the amazing engineering that went into taking the railroad over the Tehachapi's. 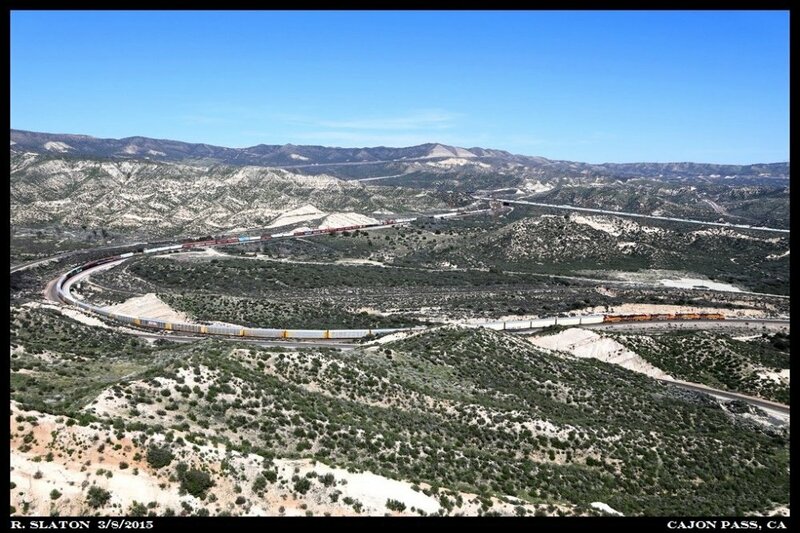 In this view 5 levels of railroad can be seen in the 4 miles between the middle of Woodford and the bottom end of Marcel. # 5079: Slithering up the siding at Rowen luck brings one more eastbound (southbound) stack train to our viewfinders before the sun prepares to call it a day. The day maybe cooling into evening but the rail action is just heating up. 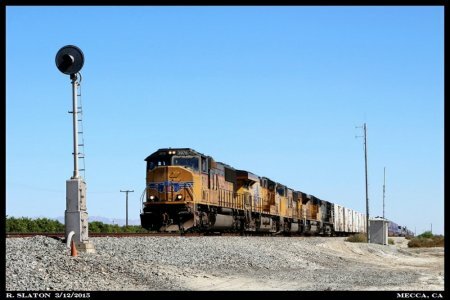 This afternoon I had some time to kill after getting off work so I made my way up to Rosamond with the hope of catching a train or two on Union Pacific's Mojave Subdivision. As luck would have it one of Union Pacific's lumber laden Roseville to West Colton manifest drags was descending the eastern slope of the Tehachapi's as I arrived into Rosamond. Getting some elevation in the hills north of town I waited it out in the wind and soon enough armor yellow and grey appeared on the horizon heading my direction. # 5061: For the most part tangent track is the definition of Union Pacific's Mojave Subdivision between Phelan and Mojave, CA however some curvature is utilized to tackle the 1.3% (max.) grade that faces trains leaving the desert floor at Rosamond. 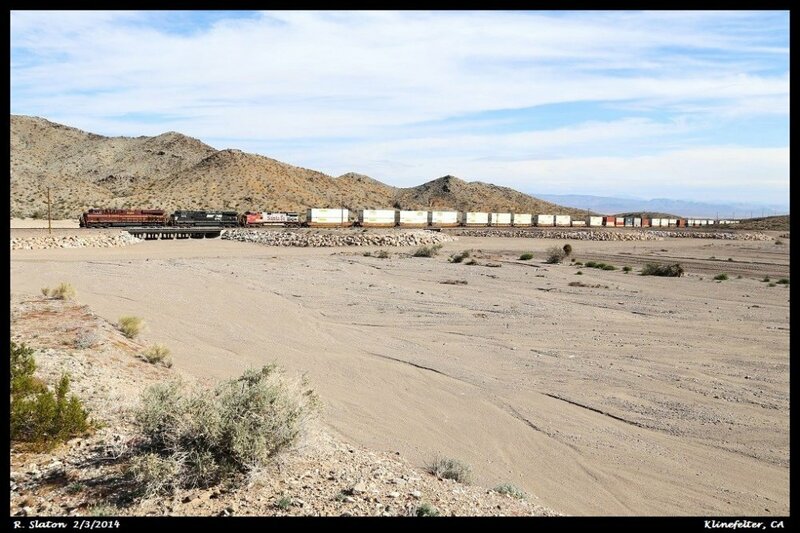 Oban is the railroad's lowest point in the Antelope Valley and from that point northbounds (westbounds in SP days) are working all the way to Tehachapi Summit, with the major grade starting in Mojave. 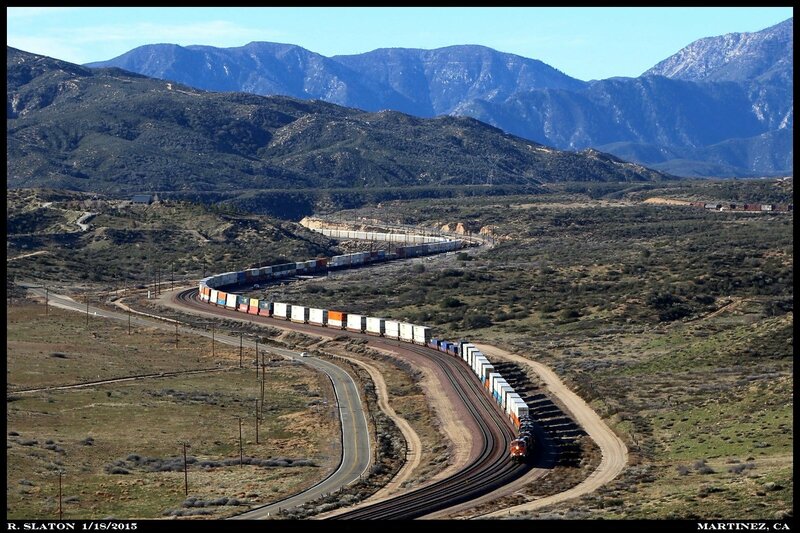 Still Ansel Hill foreshadows things to come for trains en route to do battle with Tehachapi. Situated at 'the top' of Ansel Hill is Ansel siding, weighting in at 8340' between CPSP389 and CPSP391. Slipping down grade out of Mojave and towards the floor of the Antelope Valley the QRVWC is all stretched out rounding the curve at the south end of Ansel siding. # 5062: UP C45AHs 8102 & 8159 sandwich C45ACCTE 5403 as they swing their train back towards the south, preparing to roll down into Rosamond. Now the train is in line for a near 20 mile stretch of tangent track that will lead to Palmdale Junction, there the train will 'diverge' to the east and head for Cajon Pass by way of SP's Palmdale-Colton cutoff. 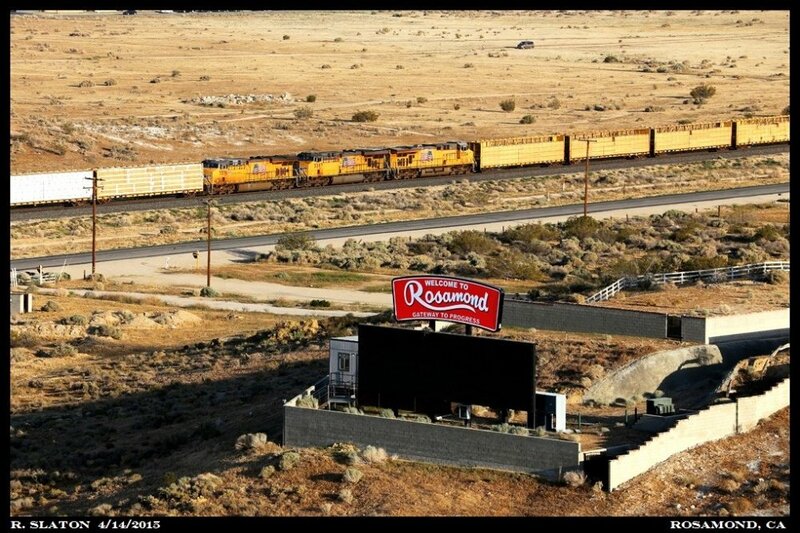 # 5063: Welcome to Rosamond....also the gateway to Edwards Air Force Base, perhaps those go hand in hand. Two-thirds back in the train UP 5304-5397-7376 coast off Ansel Hill. Once at Oban these units will trade their worth from braking to shoving the lumber drag up to Hiland (SP's Cajon Summit) where they will once again prove invaluable to the dynamic braking effort for the decent into West Colton. 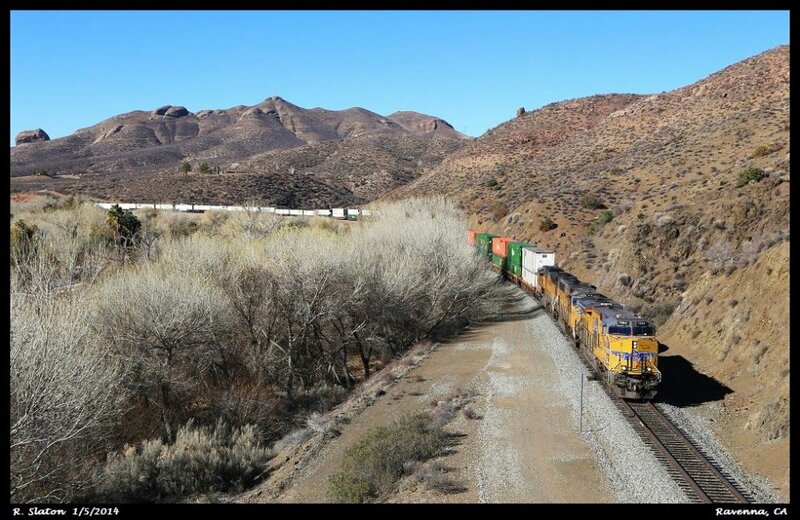 After my appointment I drove over to BNSF's Cajon Subdivision and spent the morning picking around the former Santa Fe 1st District between Helendale and Oro Grande. 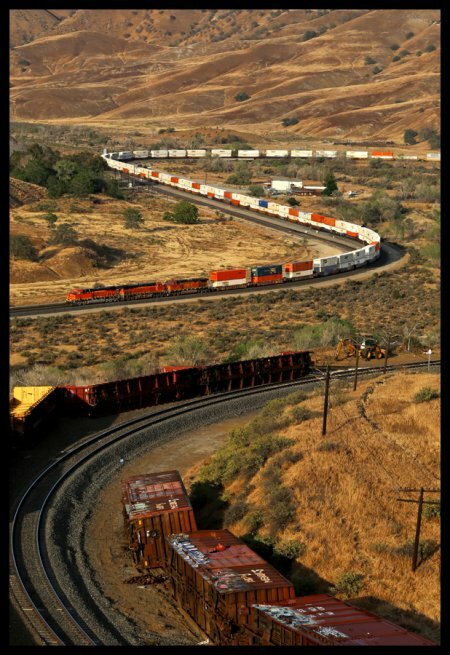 One of the mains was out of service between Victorville and Oro Grande due to maintenance of way, this created a single track 'bottleneck' on the busy Cajon Sub but trains were still in no short supply. By 1100 the sun was starting to climb high in the sky so I began to contemplate my next move. 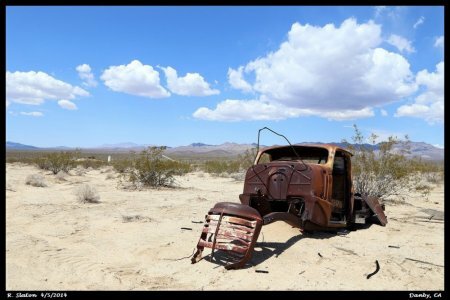 On a last minute kick I decided to make a kamikaze run out to Trona and try my luck with the Trona Road. All in all it was a great day track side. # 5064: After spending an hour around Helendale I moved back up to Oro Grande where I was treated to a pair of brand new BNSF ES44C4s. 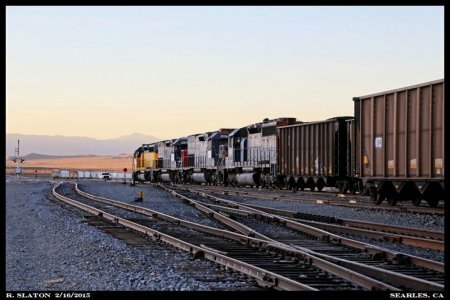 'Left hand running' immaculate C4s 8348 and 8349 (teamed up with older GEs 7350 and 6941) swing their westbound old school 'piggy back' train through Oro Grande as they continue their westbound journey. 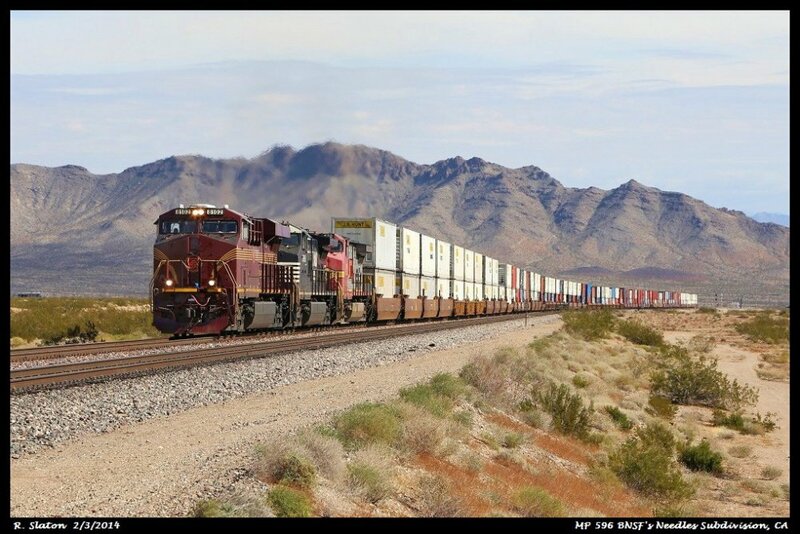 There were a few containers loaded on spine cars but this was for the most part a trailer train. # 5066: Peace will soon return to the desert after the roar from the seven hard working EMDs has become just a happy memory at Pinnacles. 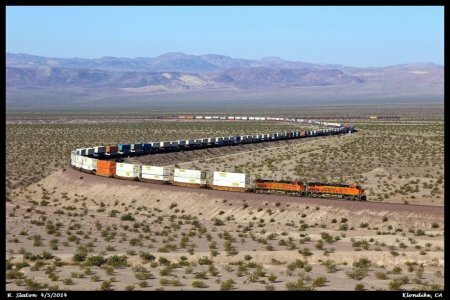 However for the crew there is still another 20 hard miles ahead before the Union Pacific interchange at Searles, CA is at hand. # 5065: Upon arriving in Trona just after 1300 the westbound job to Searles was getting ready to hit the desert so I made my way out towards Pinnacles. 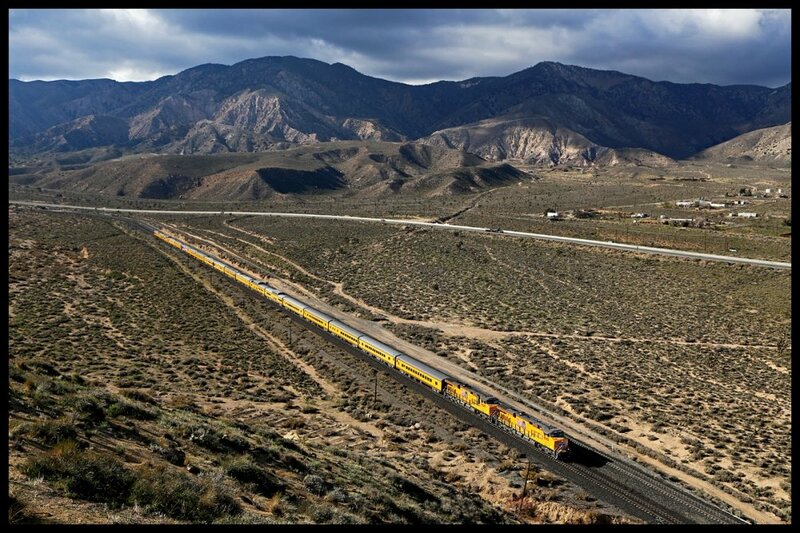 I must admit that since my first trip to Trona in October 2014 I have become captivated by the lonely desert railway. The Trona Railway is a wonderful throw back to an older era of railroading and while I did get to witness this era for a short time in my early 'railfan years' I was really to young to truly appreciate what I was seeing. 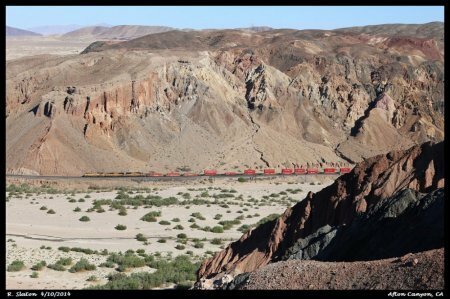 Standing at Pinnacles this afternoon the labored beat of 7 EMD 645 diesels shattered the surreal silence of the Searles Valley as they began to dig into the 1.85% grade. The smell of creosote in the old wood ties and the rhythm of steel wheels on old jointed rail completed the feeling, it was then I had to remind myself to take a few pictures! Leaving the Searles Valley floor Trona's 7 second generation SD40 products bark up the stiff grade approaching Pinnacles with a string of potash loads from the Searles Valley Minerals company tied to the draw bar. In the distance masked by the exhaust boiling out of the La Grande graduates the Trona skyline appears to be just a mirage in the vast wide open desert. 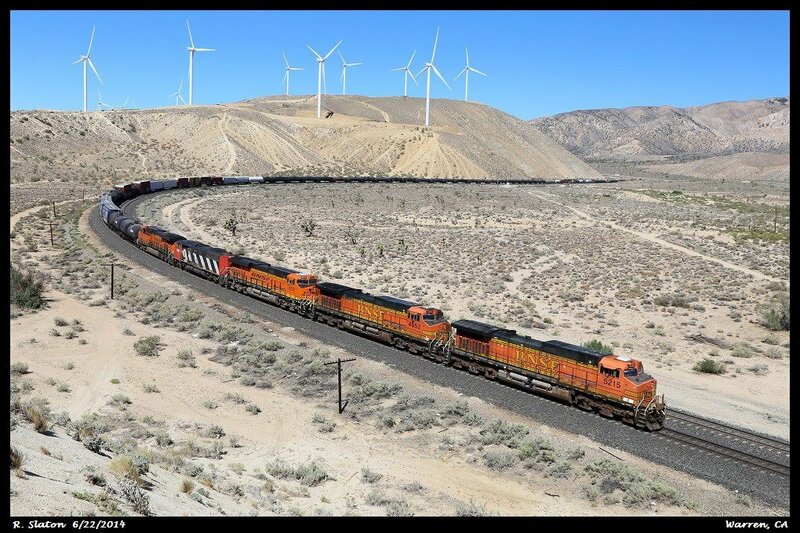 Trona SD40T-2 2005, x-SP 8541 is on the point. It is once again that seasonal time of year just before the start of Summer when we are super slow at work, as a result I was given today off which worked out really well. 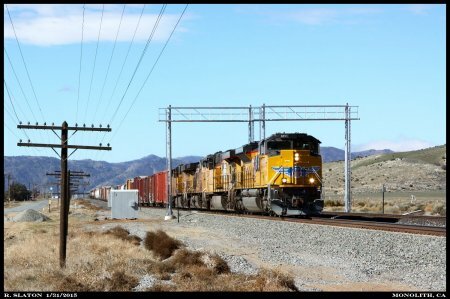 A timely heads up this morning from a friend informed me that CSX AC6000 #626 was leading Union Pacific's southbound Fresno to West Colton, CA manifest over Tehachapi. The train was already on the mountain and approaching Sandcut at 0530 so I grabbed up the camera, jumped in the ole Chevy, and made my way up to Warren. 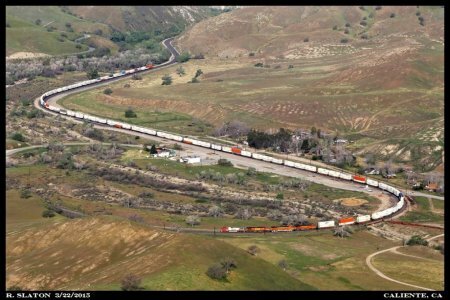 # 5067: A little after 0830 the MFRWC-21 emerged from Cache Creek canyon west of Warren and took center stage on the Mojave Subdivision, gently coasting down the eastern slope of the Tehachapi grade and conforming to the final mountain face before dropping into the Mojave Desert. 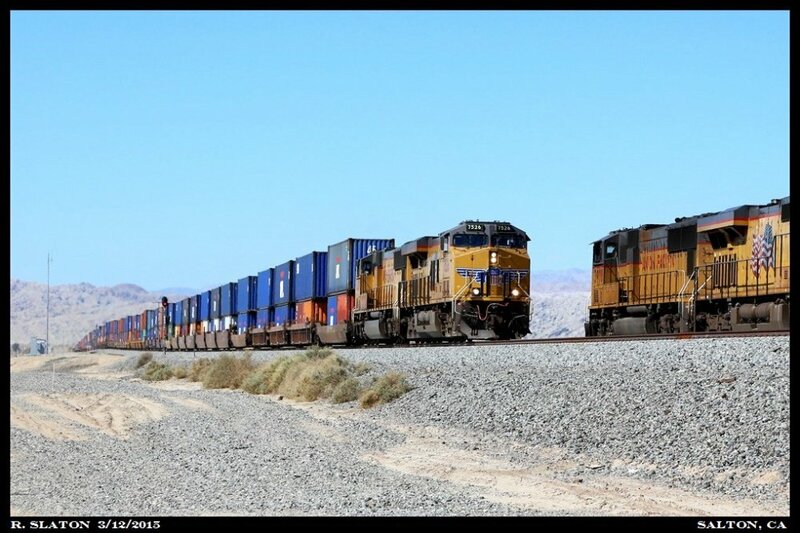 Trailing CSXT 626 were a brace of UP motors which included; UP 9606 (x-SP 8142), UP 8748, UP 7456, and UP 7996. # 5069: After clearing the south end of the yard the Fresno's power shoves into the south end of the yard with the train's conductor riding the shove. Once into the yard a Mojave based crewed arrived, working together with the Fresno's crew the set out was promptly made. # 5070: Having set out the 8748 and 7996 the Fresno's power shoves back up main 1 to tie back onto their train. # 5071: By 1100 thunder heads were starting to form up over the Tehachapi's and in the Antelope Valley. 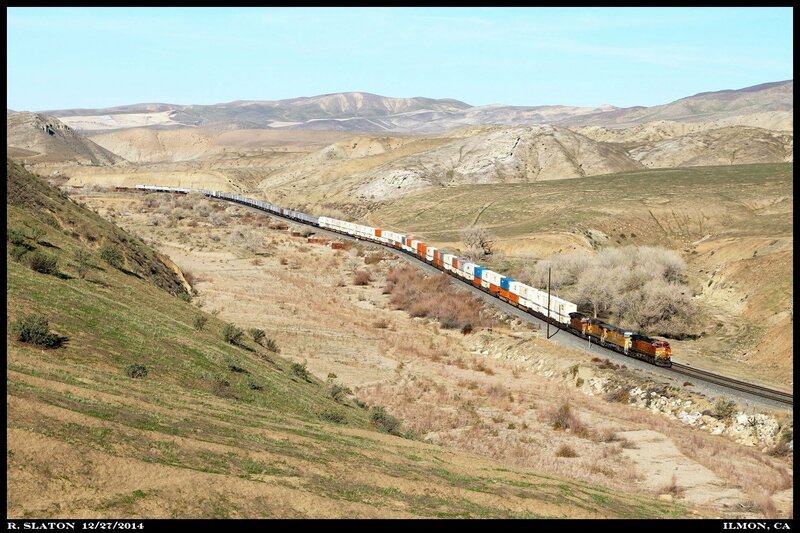 Drifting down the 1.3% grade of Ansel Hill the Fresno is once again West Colton bound. In a few miles the train will find itself at Oban and the railroad's low point in the Antelope Valley. From Oban the horses will be put back to work to drag the train up to Hiland, some 60 miles away, at the top of Cajon Pass. Friday I met up with a few friends visiting from Maryland for a day on Tehachapi. The weather early on was overcast but we found plenty of sun as they day wore on. Turned into an excellent day on Tehachapi. # 5072: Leaving Marcel a westbound BNSF manifest slips down the Tehachapi grade just prior to entering Tunnel 10 behind BNSF motors 8345-7234-7653-4371. 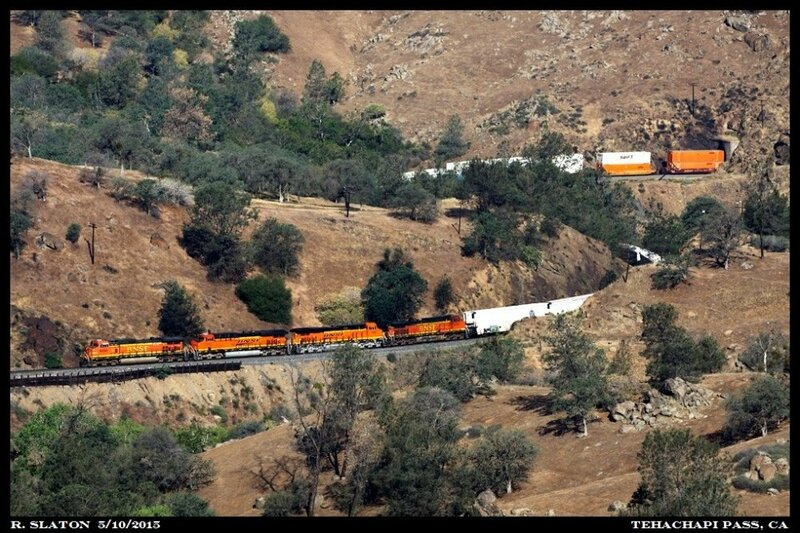 This is the 3rd time in two weeks that I have photographed the BNSF 8345 on Tehachapi. # 5073: The final train of the day was rocking a proper lead motor as we photographed it bursting out of Tunnel 5 at the west end of Cliff siding. This is the first time I have been to this location at Cliff since the searchlights came down in 2012! 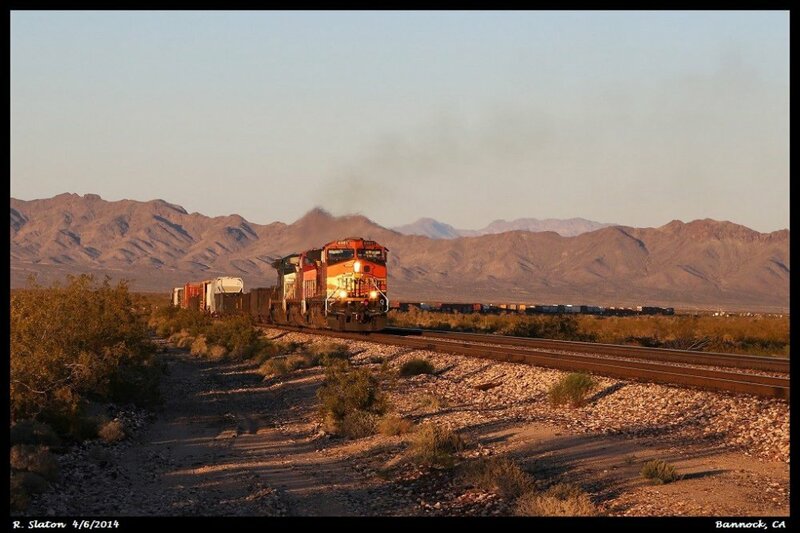 On another note someone at BNSF's power desk deserves a tall cold one on the house...there has been a rash of warbonnet leaders on Tehachapi as of late. As a matter of fact there have been 4 this month and those are just the ones I have photographed. CitiRail ES44AC 1409 is last out on this eastbound manifest. 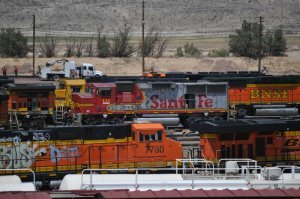 # 5074: Having just arrived from Fillmore with westbound train 100, our power (ALCo S6 #1059), is running around the train in preparation for the return trip on eastbound train 101. 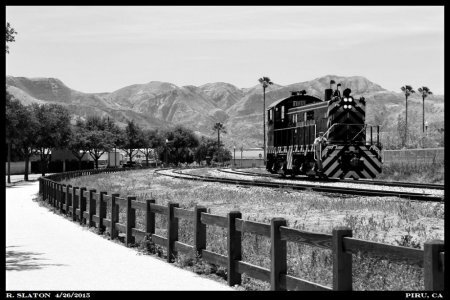 Slipping down the siding the venerable old ALCo is about to roll passed the operator's bay on the Santa Paula depot before hooking on to its train. 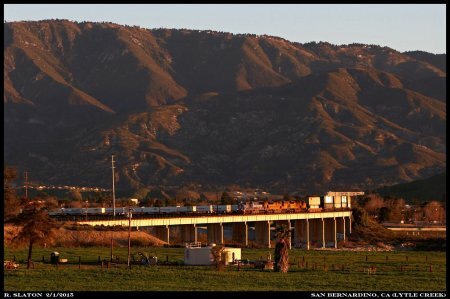 In the background at left is Sunkist's Santa Paula Orange Association which serves as a reminder of the region's once huge involvement in the shipment of citrus by rail. # 5075: After pausing in Fillmore train 101 continued on to Piru which was a new experience for me considering the last time I was in Fillmore the trackage east of Fillmore was out of service. Running around the train in downtown Piru FWRY 1059 is rolling towards its train which will become train 102 for the westbound trip back up to Fillmore. # 5076: After riding the train to Santa Paula and Piru we decided to get a few photos on the ground as FWRY 1059 made its final run to Santa Paula for the day. 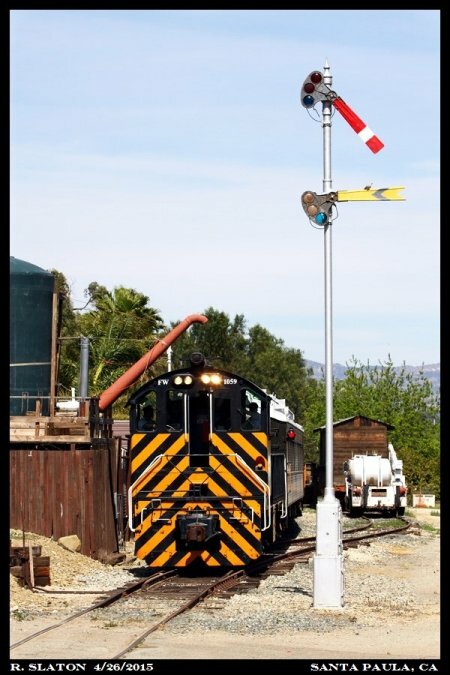 Just east of Santa Paula the S6 rumbles by a water spout and semaphore signal just prior to rolling across Highway 126. Looking at the timetable I believe this may have been near the old SP station of Kevet. 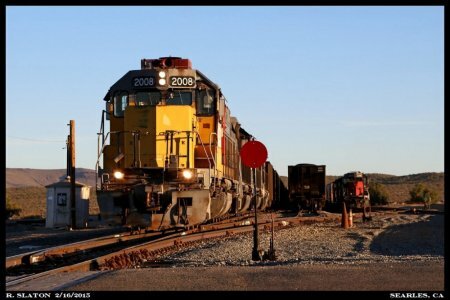 # 5080: Here is UP 2379 rocking its new paint scheme early this morning in the Mojave yard. 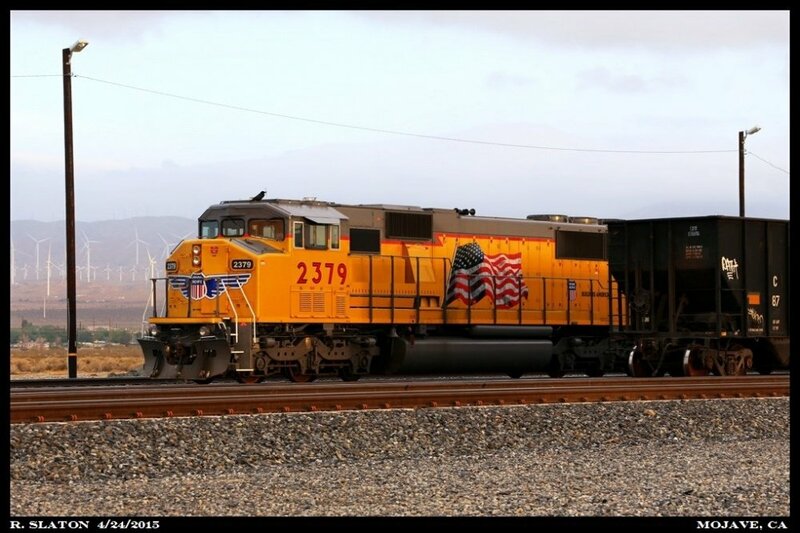 Sure caught my attention seeing an old SD60M wearing the battle flag! # 5081: Rolling down grade out of Woodford and around the Keene horseshoe curve the westbound ZLCLT has drawn one of Union Pacific's two specially painted Salt Lake City Olympic SD70Ms as its lead motor. We are 13 years removed from the Winter Games in Salt Lake but both UP 2001 and 2002 continue to represent the events that took place, still wearing one of UP's most striking special schemes and wearing it well I might add! The Cesar Chavez visitor center is in the background at left. # 5082: Last November I made a series of hikes along the mountain ridge that is straddled on its northern slope by Cache Creek and the Mojave Subdivision between Warren and Cameron. Today I returned to the ridge in the Cache Creek narrows to seek out a few locations that were not shoot-able in November due to the low Winter sun angles. 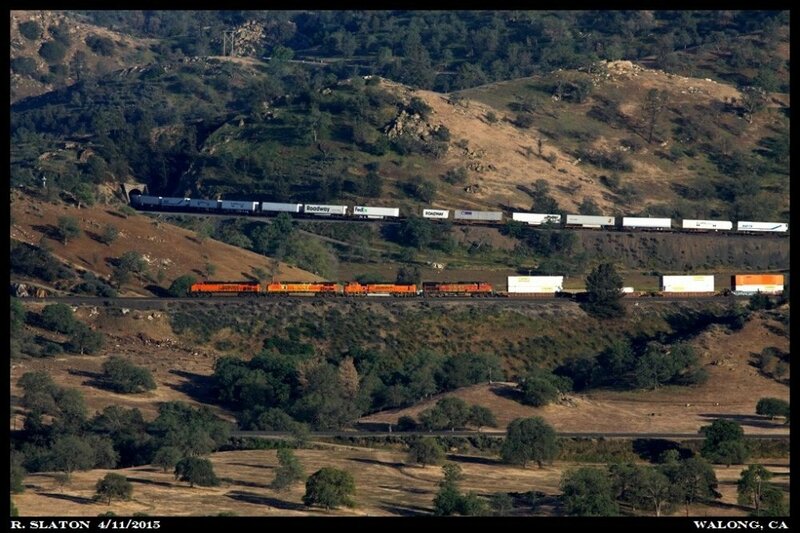 Both UP and BNSF sent me two eastbounds each allowing me to get the angles I was looking for. 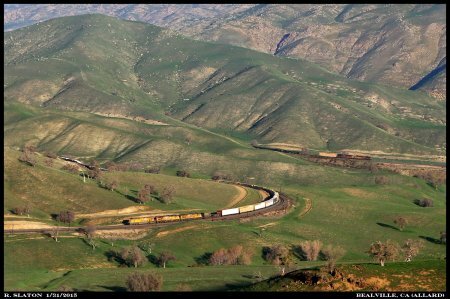 Behind a trio of Union Pacific GEVOs, led by C45AH 8073, a eastbound Roseville to West Colton manifest slips down grade through the serpentine curves along the northern bank of Cache Creek. 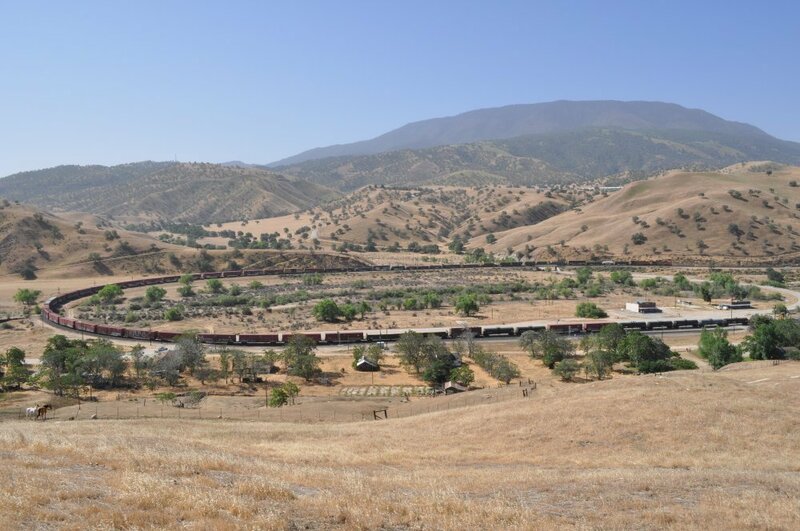 You don't have to go far on Tehachapi's western slope to be amazed at the mountain railroad that Southern Pacific forces carved into being between 1874-1876. Whether it be the serpentine curves or the frequent locations where the railroad clings to a narrow shelf situated high up on a hill side, the railroad today is every bit the achievement that it was then. Today we are fortunate that most of Tehachapi's western slope is not to far away from paved roads however one stretch of the mountain between Rowen and Bealville does lay hidden from the eye of the casual traveler on near by California Highway 58. Leaving Bealville the railroad finds itself precariously perched high above the Tehachapi Creek valley at the appropriately named station of Cliff. 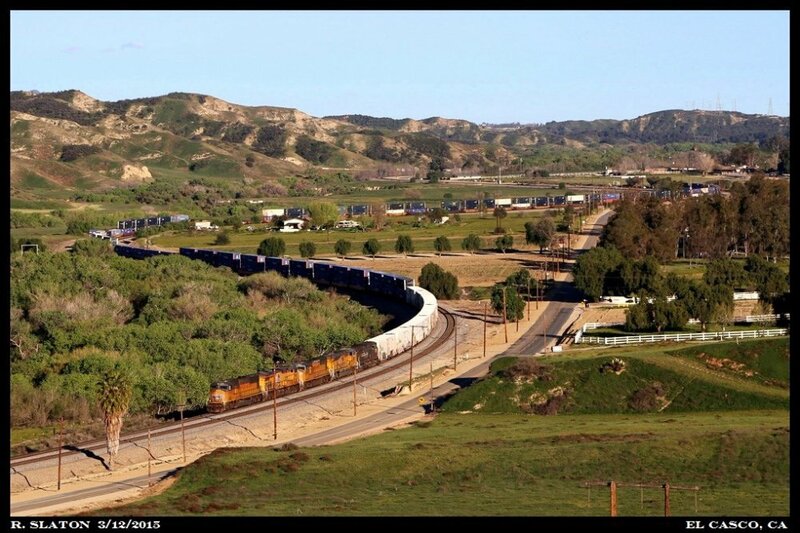 From Cliff the railroad's situation remains the same until it reaches the west end of Rowen where the right of way finally regains some 'breathing room' on either side. # 5083: Leaving Cliff the Mojave Subdivision finds itself firmly clinging to a narrow shelf carved into the mountain side as it heads for Rowen. 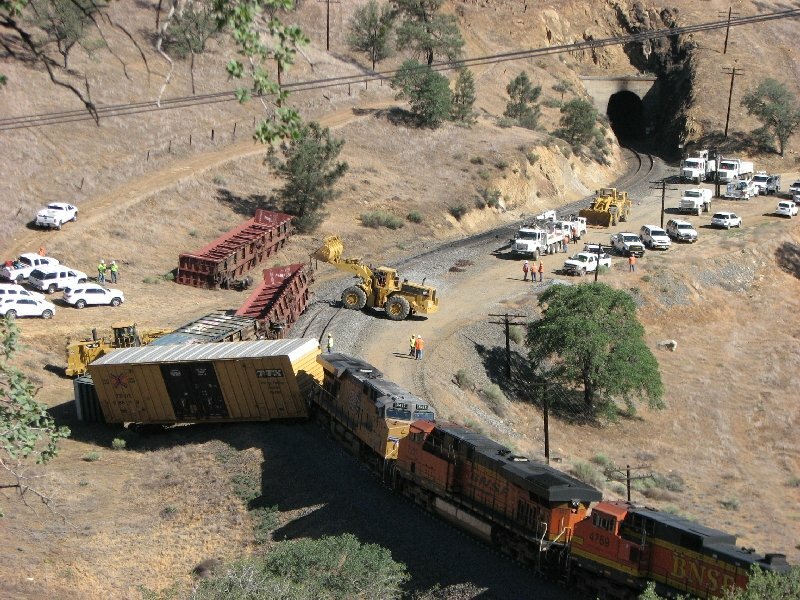 Two tunnels were blasted into being as the railroad continued east and today tunnels 7 & 8 bookend the most famous of Tehachapi's long 'drop offs'. Leaving Tunnel 8 trains make a series of snaking 'S' curves before Rowen is at hand. Emerging from a deep rock cut and yet still at times suspended up high above Tehachapi Creek BNSF 4495-7245-7981-4467 work towards Rowen. The east portal of Tunnel 8 can be seen at upper right. 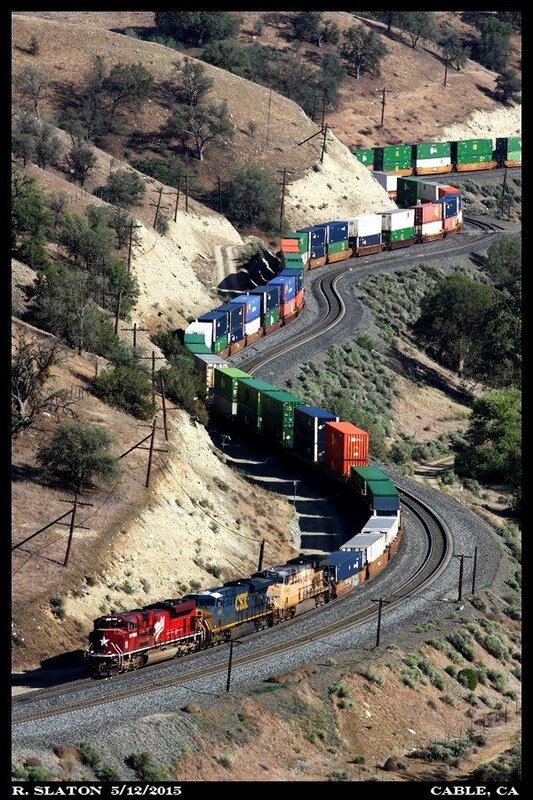 # 5084: Zooming out offers a overall view of this remote stretch of railroad as it leaves Cliff. With the reefers, containers, and pigs highlighting the contour of the Mojave Subdivision the head end prepares to diverge onto the siding at Rowen to make a meet with a northbound BNSF Z train. 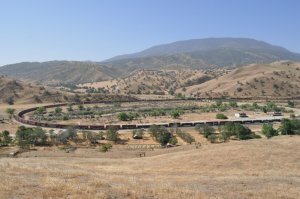 The rear end of the southbound is still high above the Tehachapi Creek valley between tunnels 7 & 8, the latter of the two is near the center of the image. # 5085: A full wide angle view of the west end of Rowen as the southbound climbs into the siding for a meet. 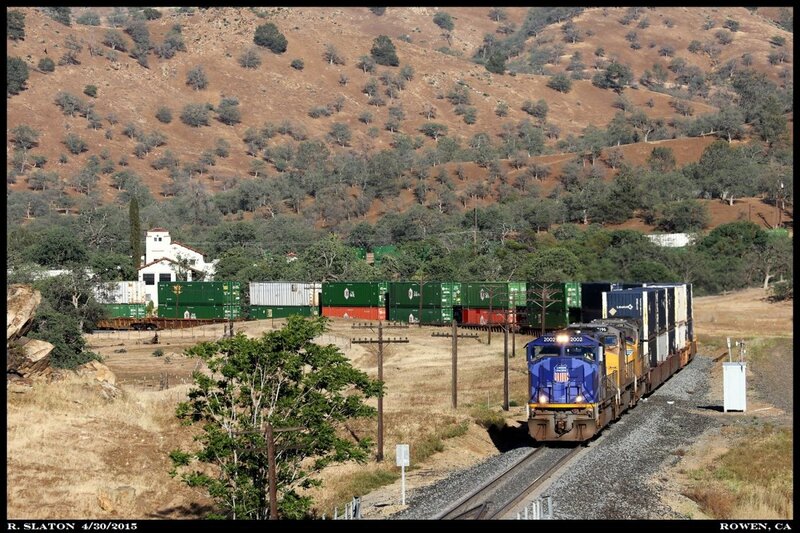 # 5086: After making a meet with a northbound at Rowen green boards guided BNSF 4495 on up the hill. I paused just below the Cable Cross-Overs for one more shot of the southbound hotshot. 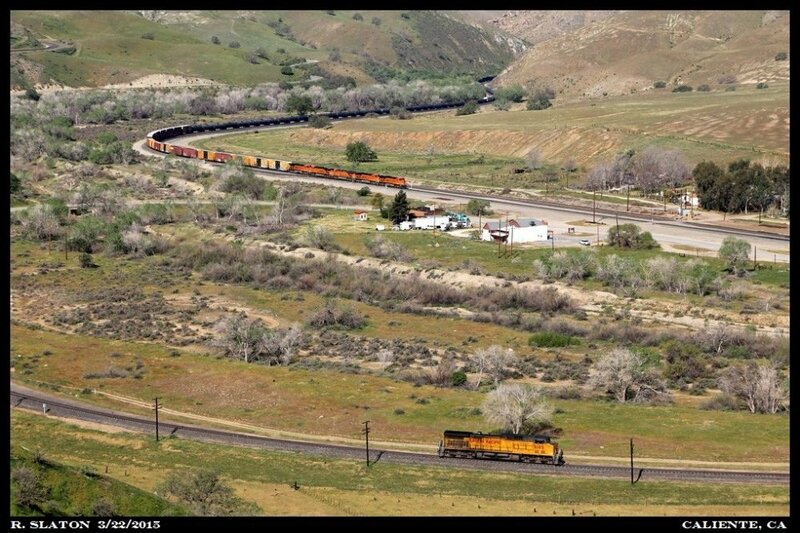 Although mostly filled up the train's rear motor is crossing the 7th and final bridge crossing of the Tehachapi Creek. # 5088: With the wide open Mojave Desert as its backdrop the ZLCLT-12 is just south of Fleta as it works towards Mojave. 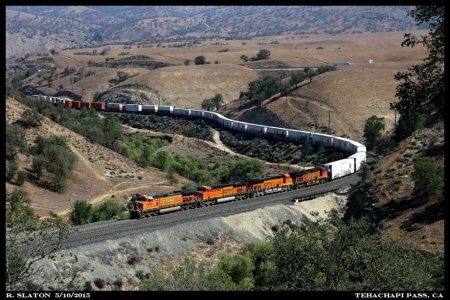 # 5089: Having topped Tehachapi Summit the 'Lathrop Z' slithers down grade approaching the end of double track at Cable. The primary colors of the head end consist, which includes: UP 1988-CSXT 5489-UP 6946, adds to the already colorful Z train's make up. # 5090: With Bakersfield nearly within their sight the ZLCLT swings through the curves leaving Ilmon. With the twisting Tehachapi confines at their back the scene is bathed in low hanging sunlight that will soon be erased by the rolling hills as another day on the mountain nears its end. 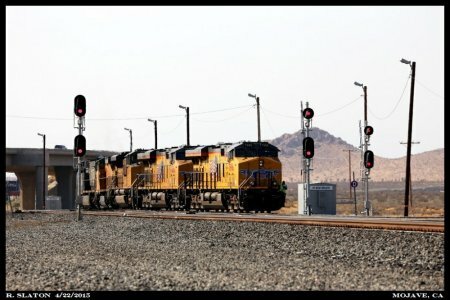 # 5130: On March 3rd, 2015 a 19 car Union Pacific special ran between Roseville, CA and West Thenard, CA (near the LA/LB ports). This impressive lash-up of UP varnish consisted of several cars coming out of Winter storage in Oakland but also contained a few cars of VIPs. 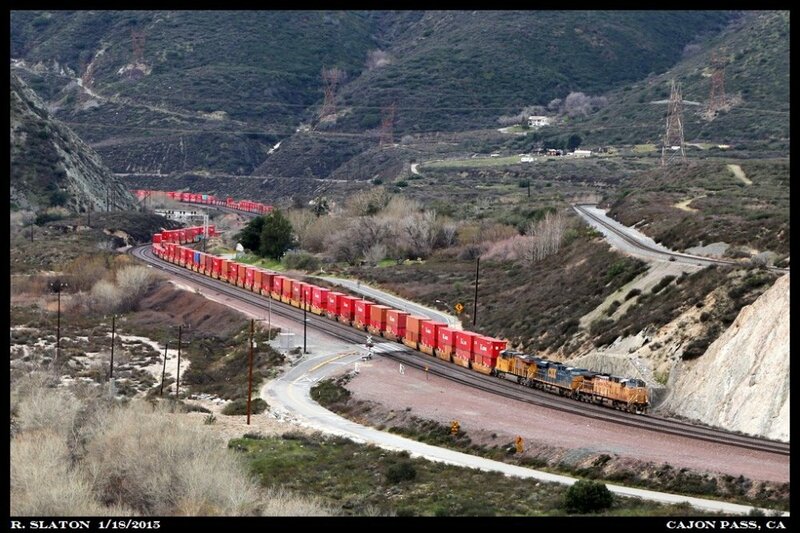 Getting out of work a little early I made my way up to Caliente, CA and followed the 19 car train back over the mountain. 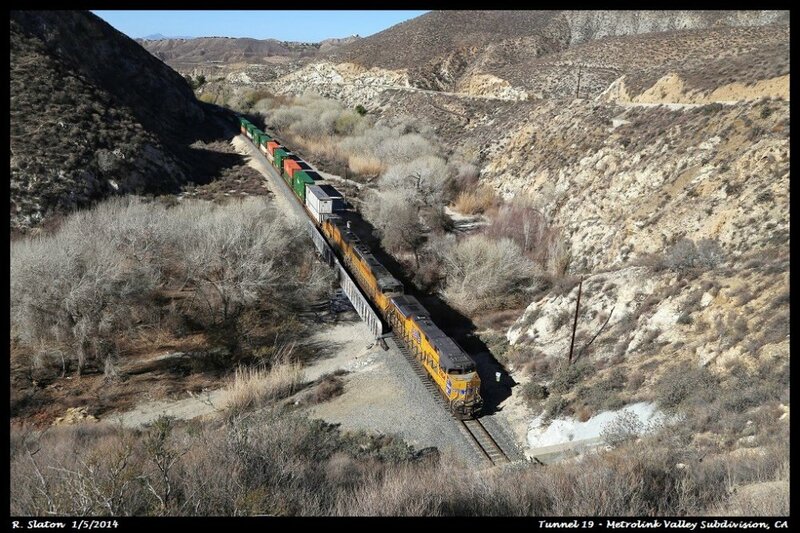 UP 5472 has just received a fresh crew and is once again rolling towards Bakersfield as it meets UP 8142 at the east entrance to the Caliente Creek narrows. # 5131: Running point were immaculate C45AHs 8142 and 8128 which have just rumbled across the switch at the north end of Woodford. 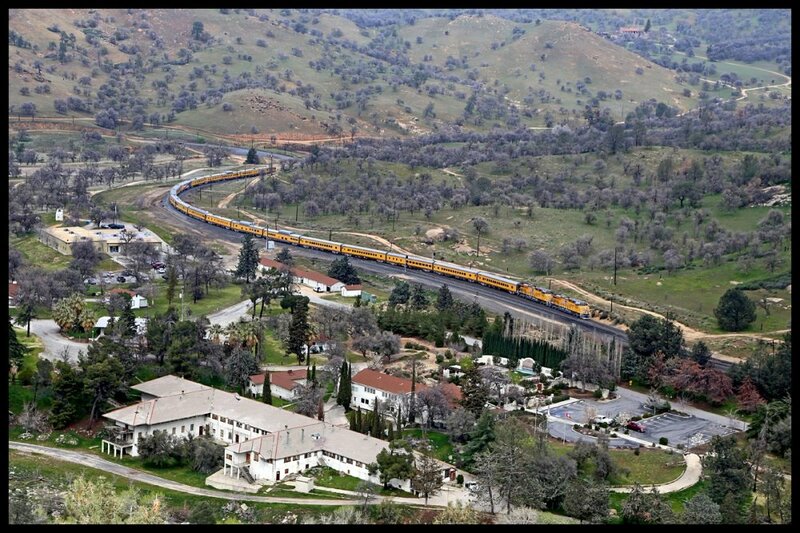 The small hamlet of Keene, CA sits in the foreground. The large white building at lower-left was once the 'Stonybrook Retreat' Tuberculosis Sanatorium, the building now stands on the grounds of the Cesar Chavez visitor center. # 5132: Rolling out from under the thick cloud bank that had situated itself over the Tehachapi's UP 8142 and company are now bathed in warm afternoon sun light as they leave the Cache Creek narrows east of Warren. 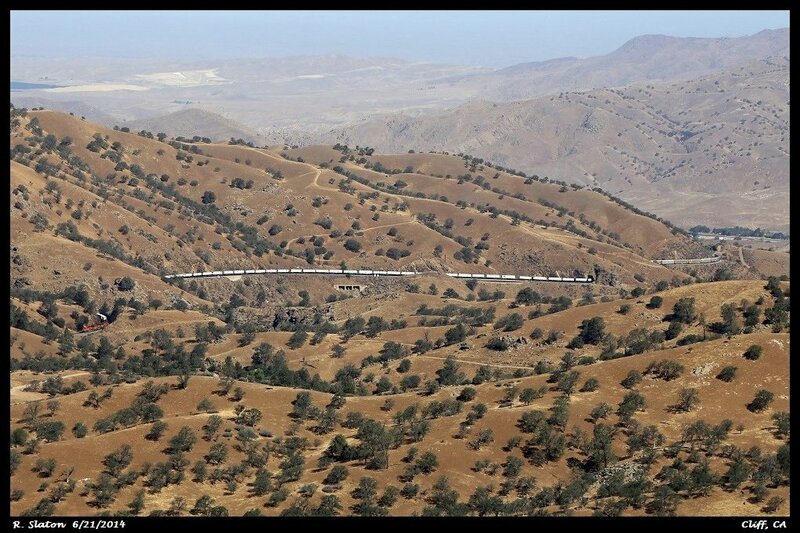 Tehachapi's eastern slope finds the railroad dropping out of the Southern Sierra's and into the vast Mojave Desert. 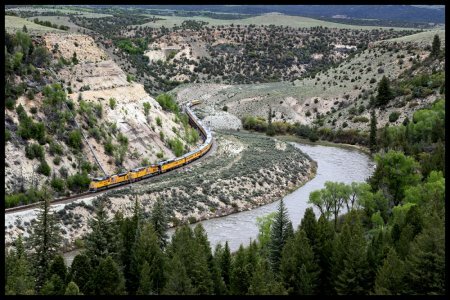 # 5133: On May 29th, 2015 I jointed friend and fellow TO member SP8595 on an all day outing to photograph a 17 car special running between Denver-Dotsero-Denver (Colorado) on the former Rio Grande. We started our day at Winter Park, CO (at the west portal of Moffat Tunnel) and followed the special west all the way to Dotsero. Near Burns, CO the special is conforming to the Moffat Tunnel Subdivision as it heads west following the banks of the Colorado River. # 5134: After turning the train at Dotsero the special would follow Amtrak 6 back east to Denver. Clinging to the railroad's narrow foothold in Little Gore Canyon the 17 car train, led by SD70AH 8952 & C45AH 8239, swim up stream via the 'Mainline through the Rockies'. 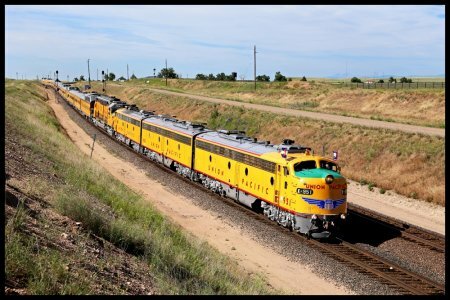 # 5135: The final photo is not of a business special but rather UP's annual Cheyenne Frontier Days special, drawn by a classic set of UP Es...with DDA40X 6936 lending its 6600 horses to the effort as well. The 21 car CFD special has just come off the Greeley Subdivision at Speer Jct., WY and is now on main 4 of Union Pacific's Laramie Subdivision for the final 8 mile descent into Cheyenne. Going through my archives the other day I dusted off a few images from Tehachapi, also respectively referred to as 'the mountain'. 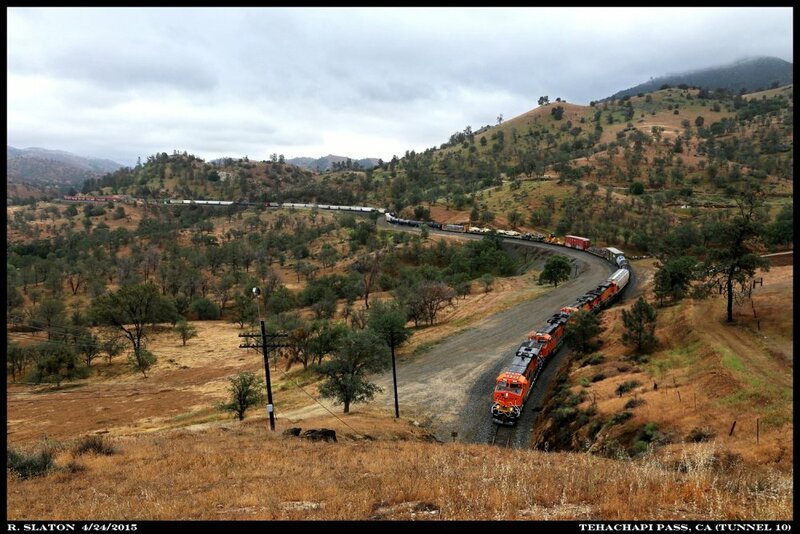 Before heading off to work this morning I thought I might share a few images of BNSF trains doing battle with Tehachapi from early May 2015.